I’ve been down a schoolwork hole the last couple of weeks. I’m studying to be a pharmacy technician and while I’m really enjoying the program, I admit it is more science and math than I’ve done in years. That means I’m reading, re-reading, making flashcards, Googling formulas, performing lab experiments, and taking practice tests pretty much every day. Today it was time for a break, and there is no better way for me to relax than (what else?) baking! After all, too much of anything is overkill and after a certain point you stop retaining information. 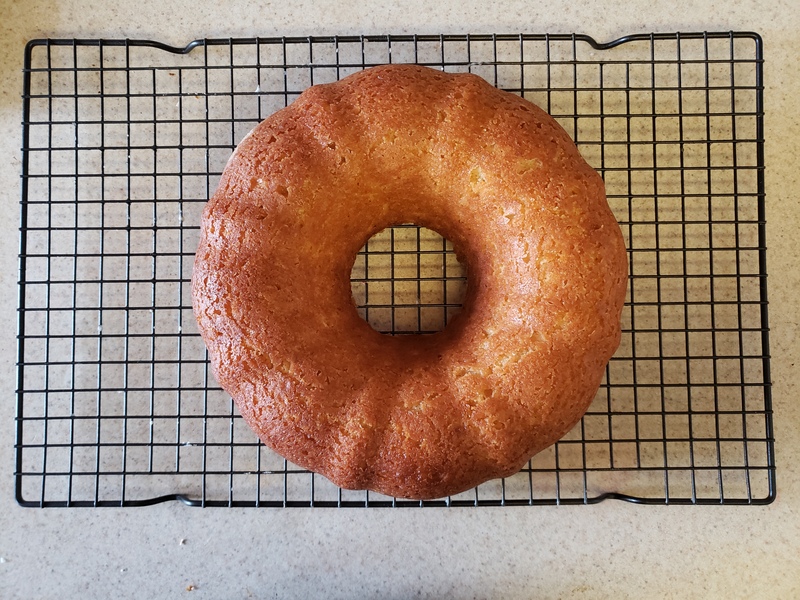 I wandered into the kitchen and decided it was time for cake. Something warm and wintry felt right in the midst of all the recent ice and snow. What came to mind immediately was the combination of maple and bourbon with their sweet, rich caramel notes. And I thought a butter cake would be the perfect vehicle. So take a study break with me! 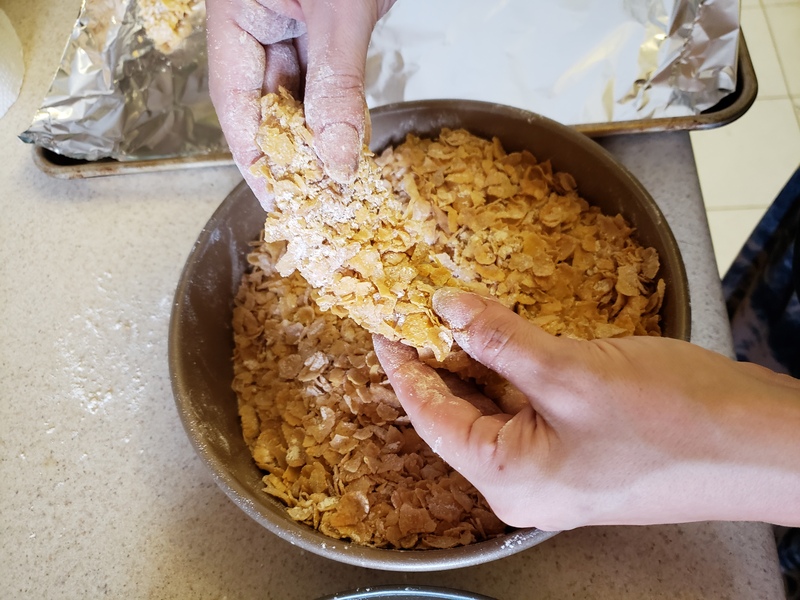 Combine the flour, baking powder, baking soda, and salt in a small bowl and set aside. 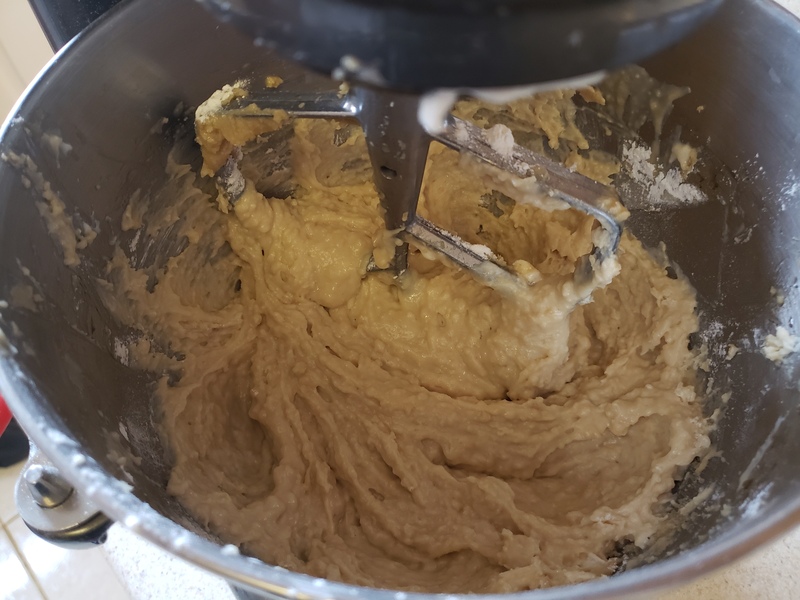 In the bowl of a stand mixer or using a hand mixer, beat the butter and brown sugar on medium speed until light and fluffy. Add the eggs one at a time, beating well and scraping down the sides of the bowl between additions. 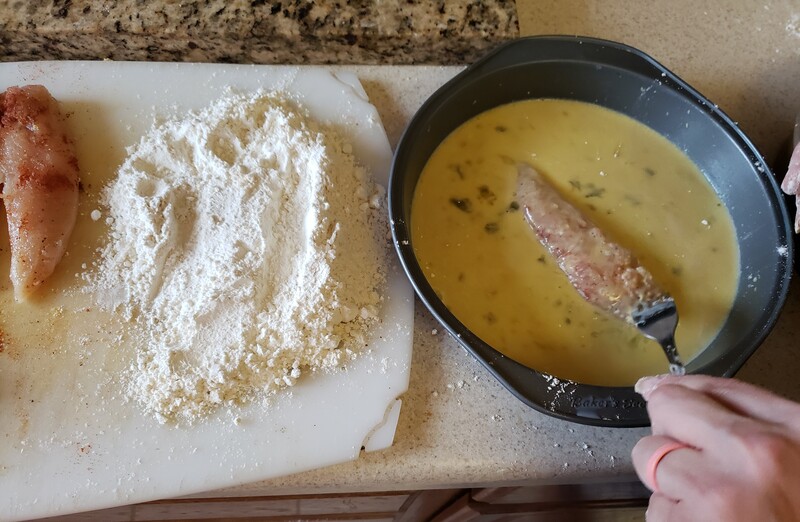 Add half of the flour mixture and beat until incorporated. 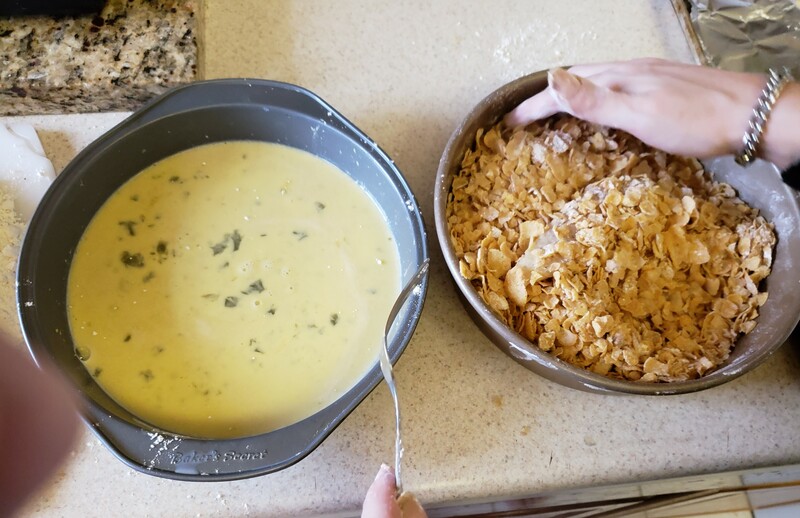 Mix in the yogurt and vanilla extract, scraping down the sides of the bowl as needed. 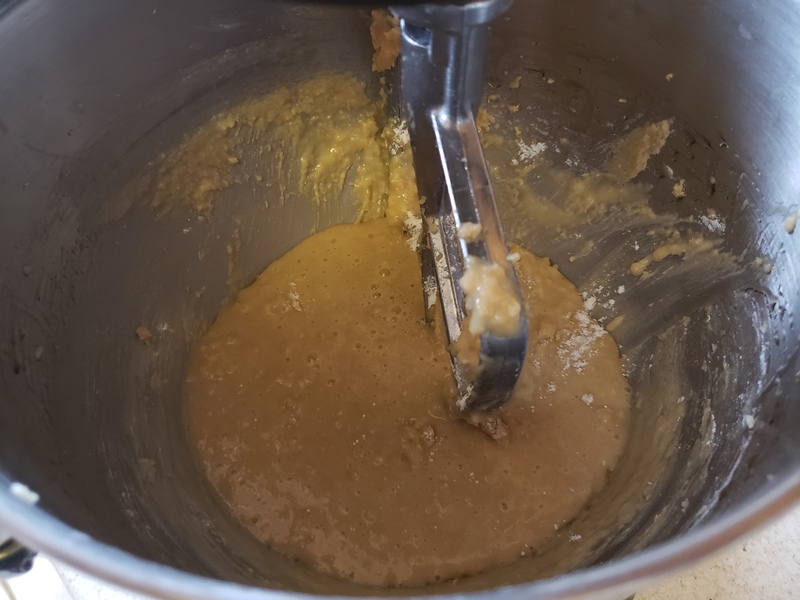 Add the rest of the flour mixture and beat until just combined. Pour the batter into the prepared pan and spread evenly. Bake the cake for 45 minutes, or until a toothpick inserted in the middle comes out clean. 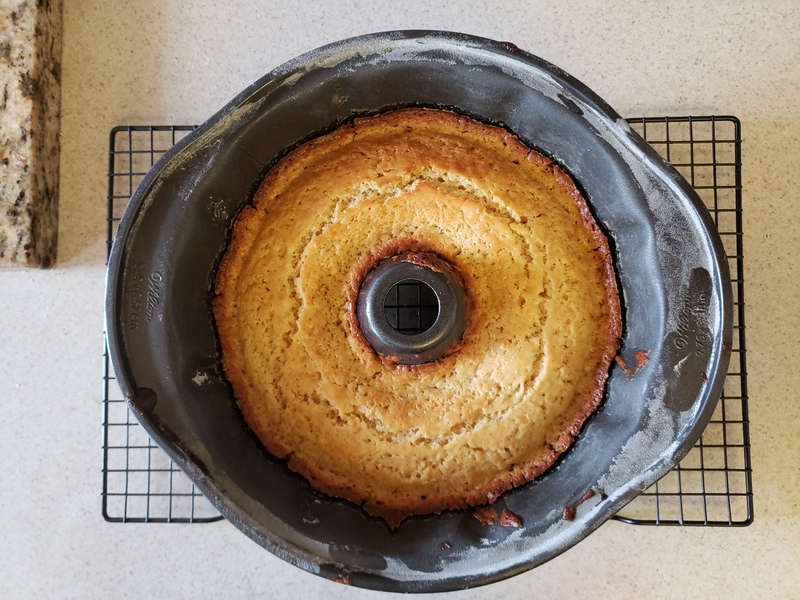 Cool the cake in the pan for 10 minutes and then invert onto a wire rack. 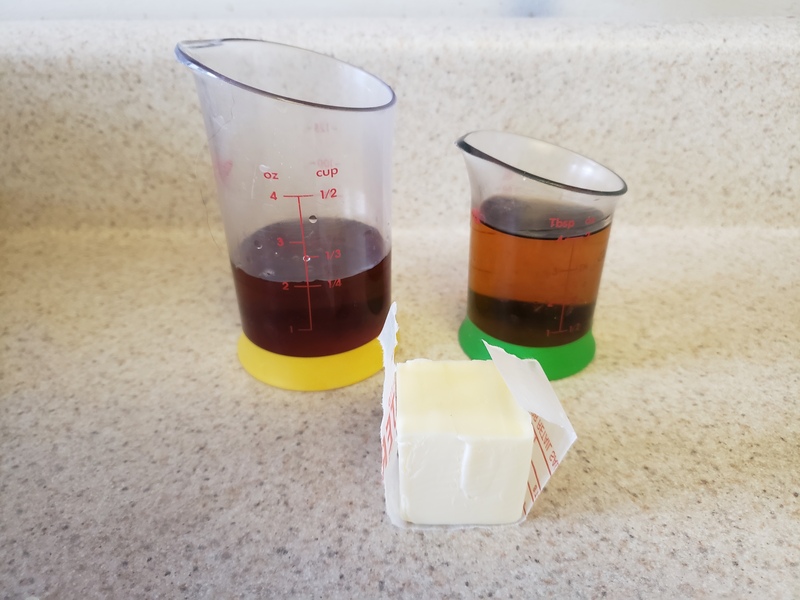 To make the glaze, combine the bourbon, butter, and maple syrup in a medium saucepan. 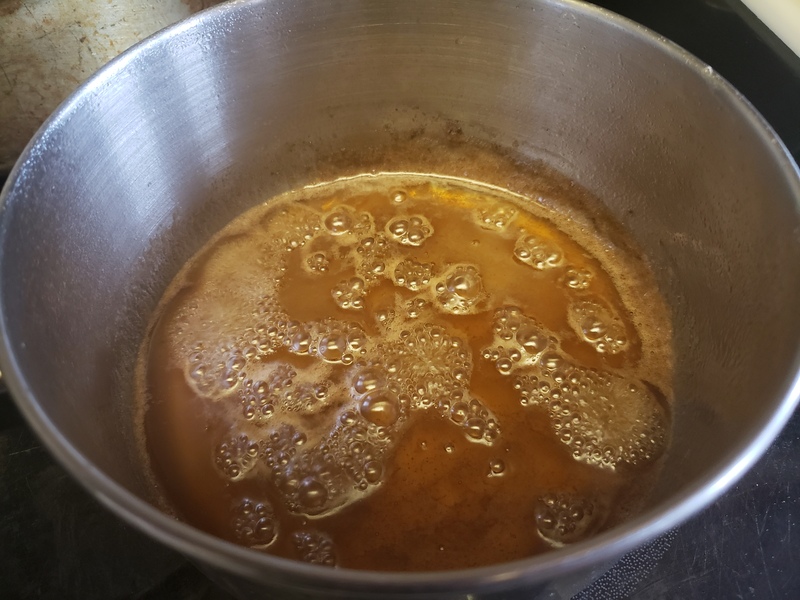 Bring to a boil and then reduce to a simmer and cook for 10-12 minutes or until it becomes syrupy. 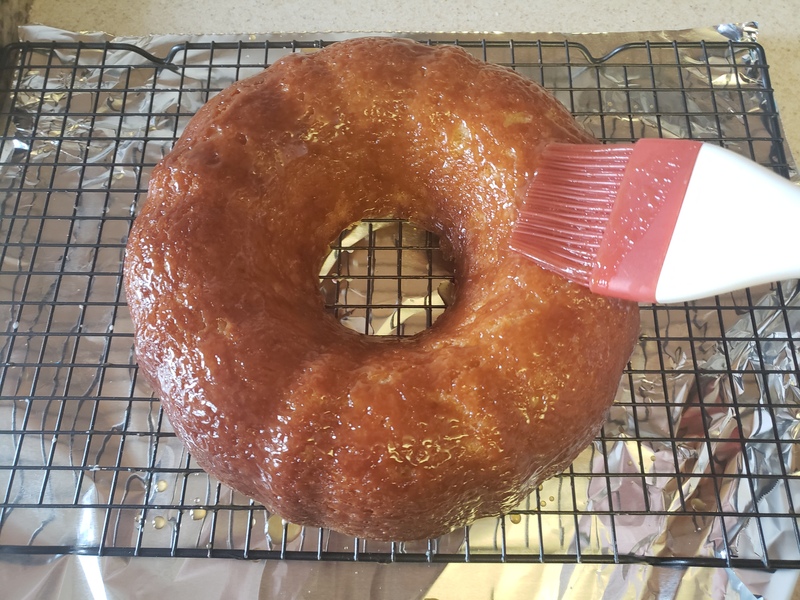 Brush the glaze over the warm cake. 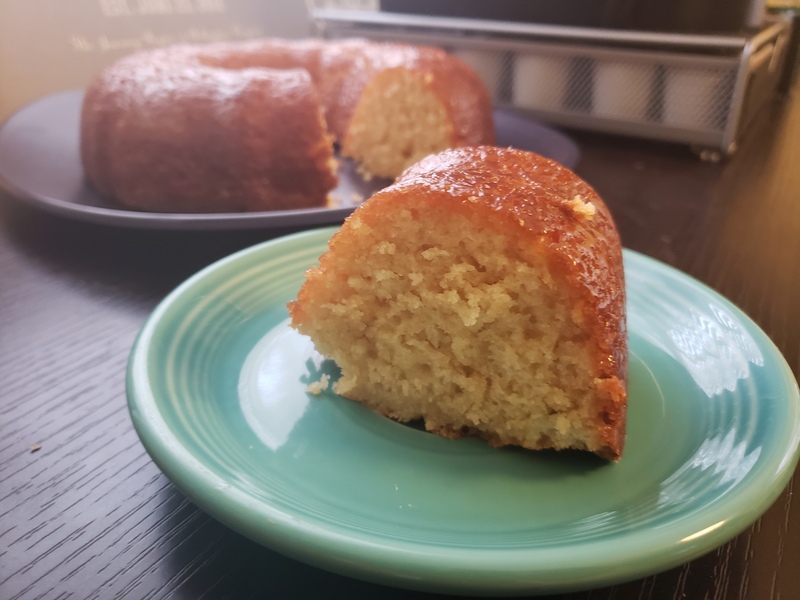 The cake is surprisingly light and very moist. 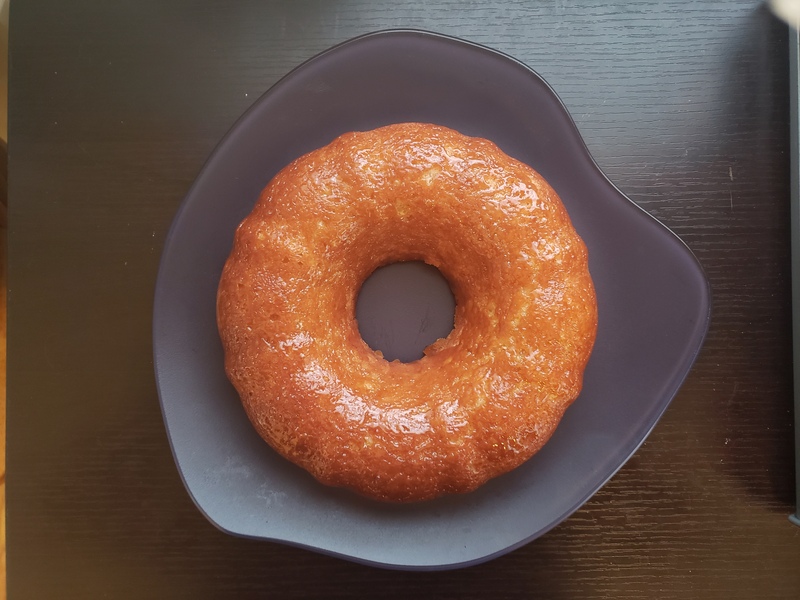 The bourbon-maple glaze is sweet without being cloying and adds just the right finish to the rich cake. This one is perfect alongside coffee or tea and the flavor reminds me a lot of pancakes with butter and syrup. Now that I’ve made some sustenance and taken a break to have some playtime, it’s back to the books. But don’t worry, I can never stay out of the kitchen very long. Occasionally I find myself making something for the thousandth time and wondering, “Why have I not put this on the blog yet?” Usually I think maybe it’s too simple or not “special” enough…but if it’s good enough to make over and over and over again, doesn’t that make it definitely worth sharing? I think so. And that’s certainly the case with today’s post. 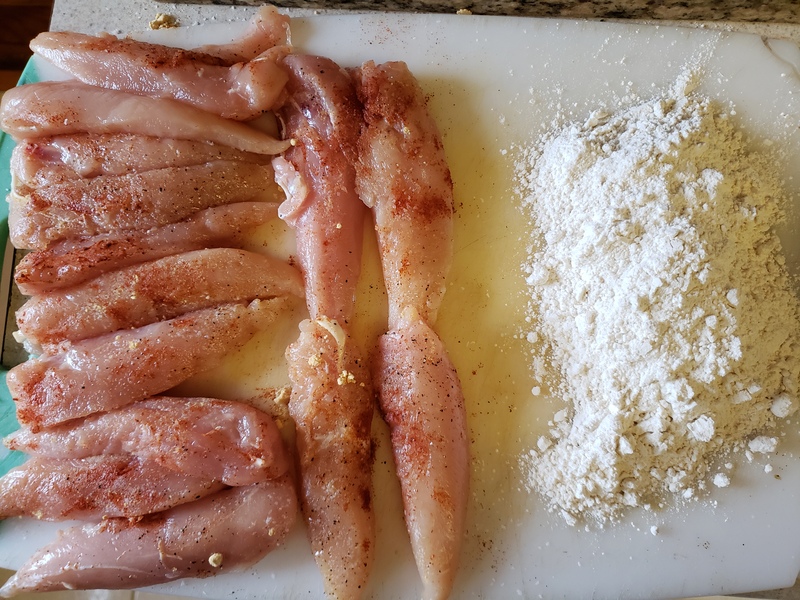 Pat the chicken breast pieces dry season liberally with salt, pepper, paprika and dry mustard. 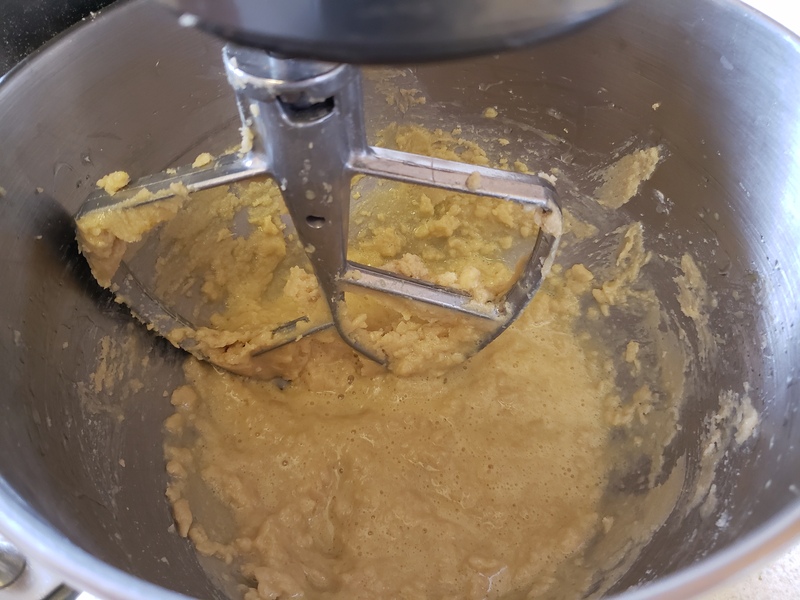 Whisk together the eggs, milk, and Dijon mustard. 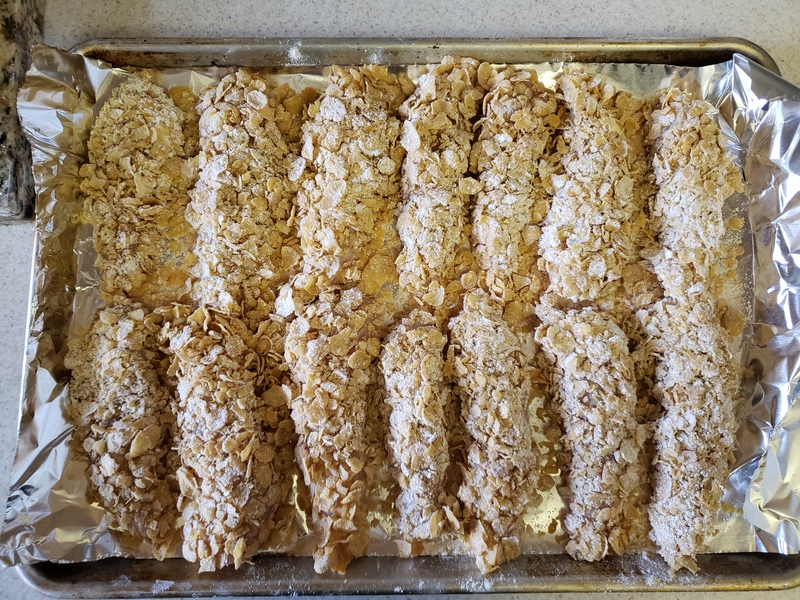 Arrange your breading stations: Dredging flour, egg mixture, and corn flake/flour mixture. Have a pan lined with aluminum foil ready. 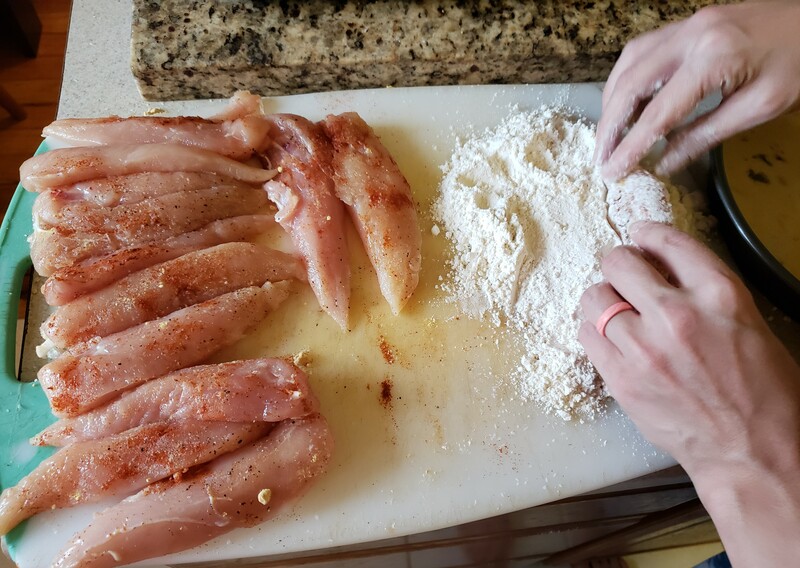 Dredge the chicken in the flour and shake off the excess. Next, dip the chicken in the egg mixture and let the excess drain off. 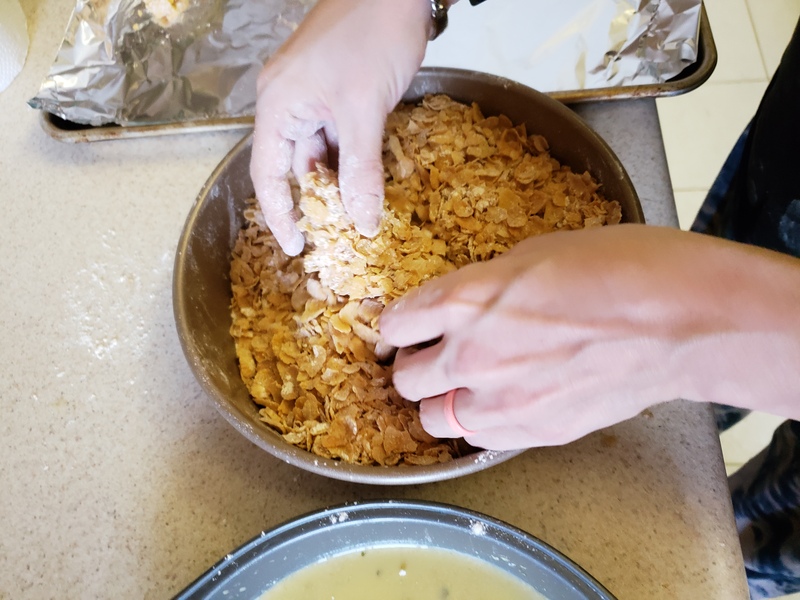 Finally, roll the chicken in the corn flake/flour mixture, gently pressing to get the crumbs to adhere. 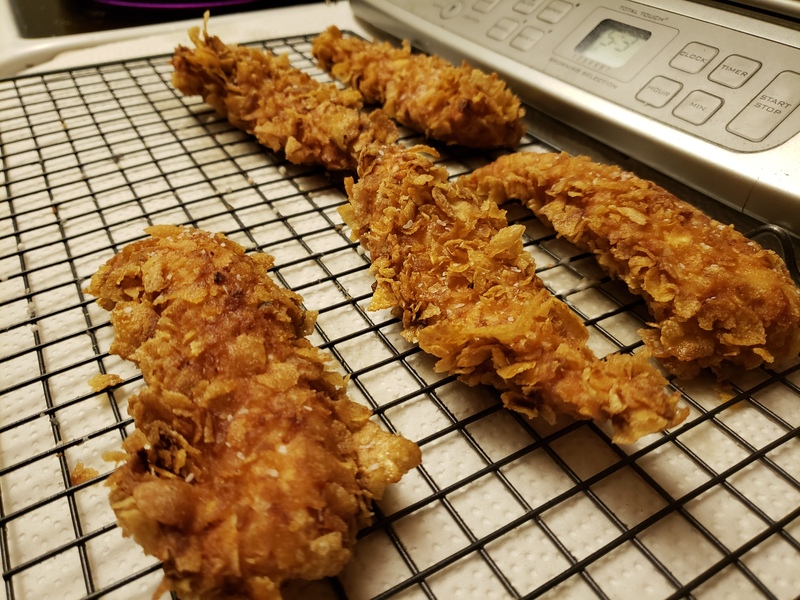 Move the breaded chicken to a pan lined with aluminum foil and refrigerate for at least an hour to allow breading to set well. To fry, preheat about 1-2 in. 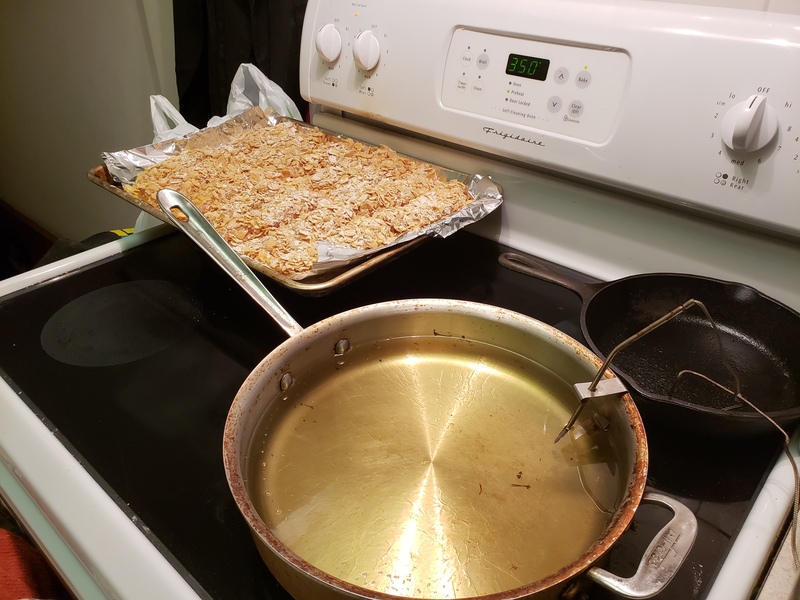 of oil in a deep pot or saute pan to 350 degrees F. Have an upside-down cooling rack over some paper towels ready for draining the finished chicken. 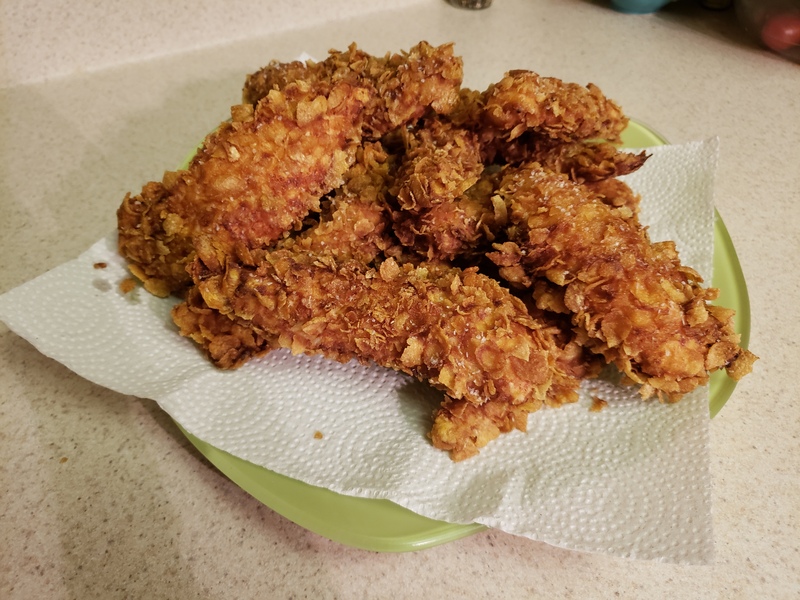 Fry the chicken pieces for 3 minutes or until golden brown. 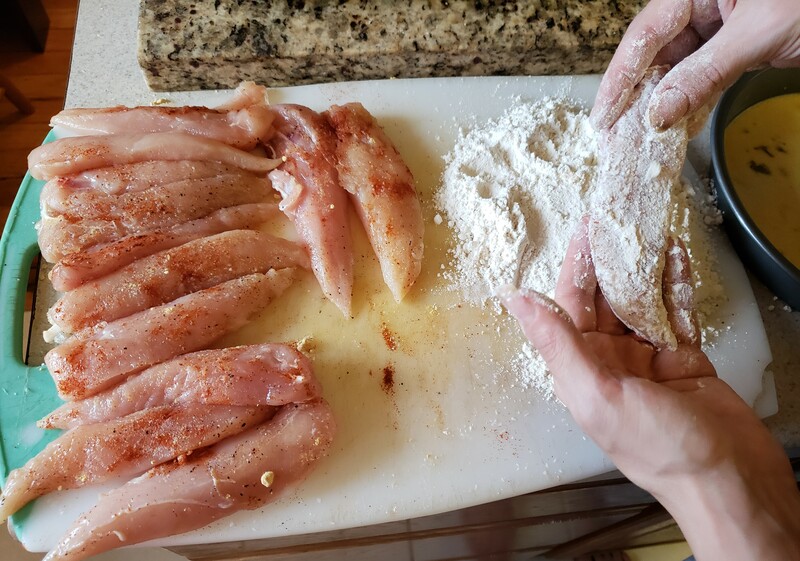 Move the chicken to the cooling rack and season with salt. And that’s it! A few simple ingredients and a speedy cooking time make this a great weeknight meal. I especially like that you can prepare your chicken hours in advance and fry whenever you’re ready to eat. 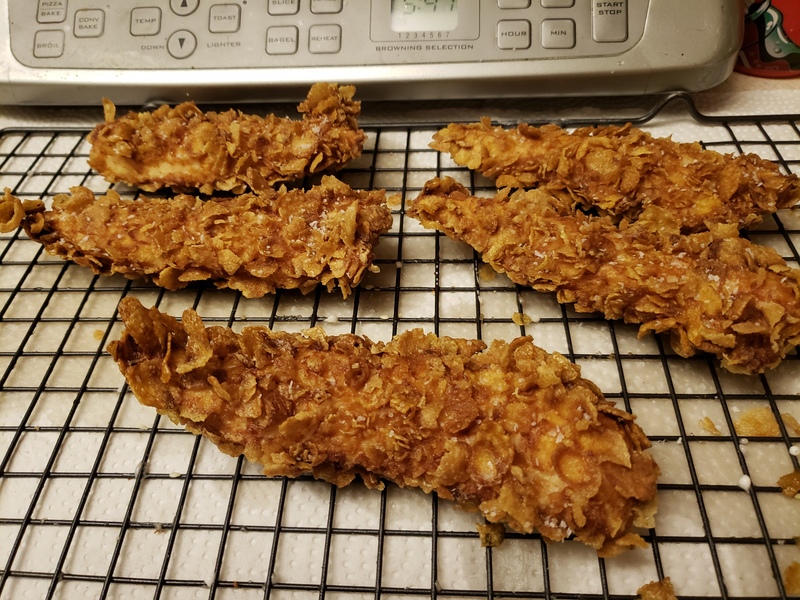 The corn flakes make for a spectacular crunchy crust and the meat stays juicy due to the short cooking time. Things don’t always have to be complex to be special. 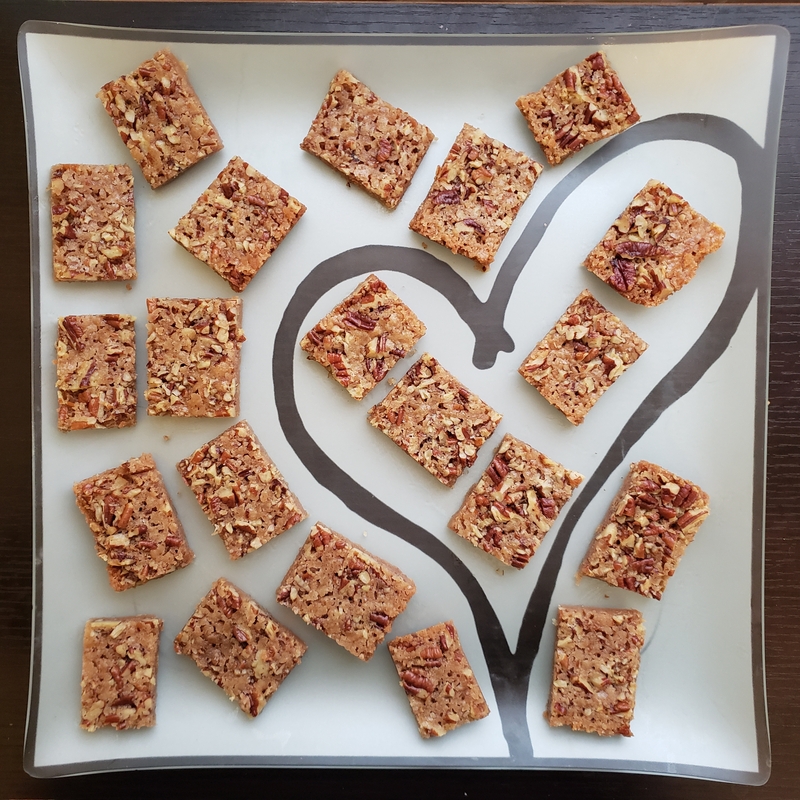 I hope this recipe sticks around in your kitchen just as much as it has in mine. 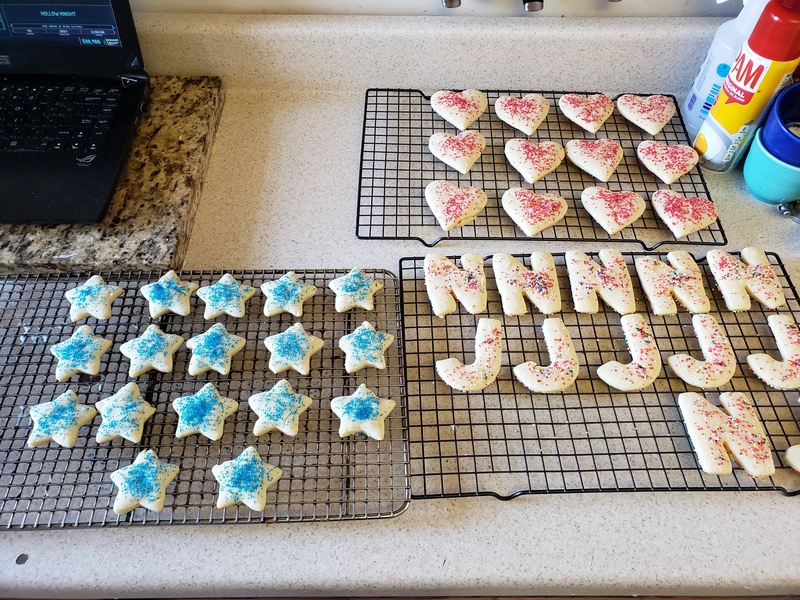 I missed Christmas cookie baking season for the first time in YEARS. 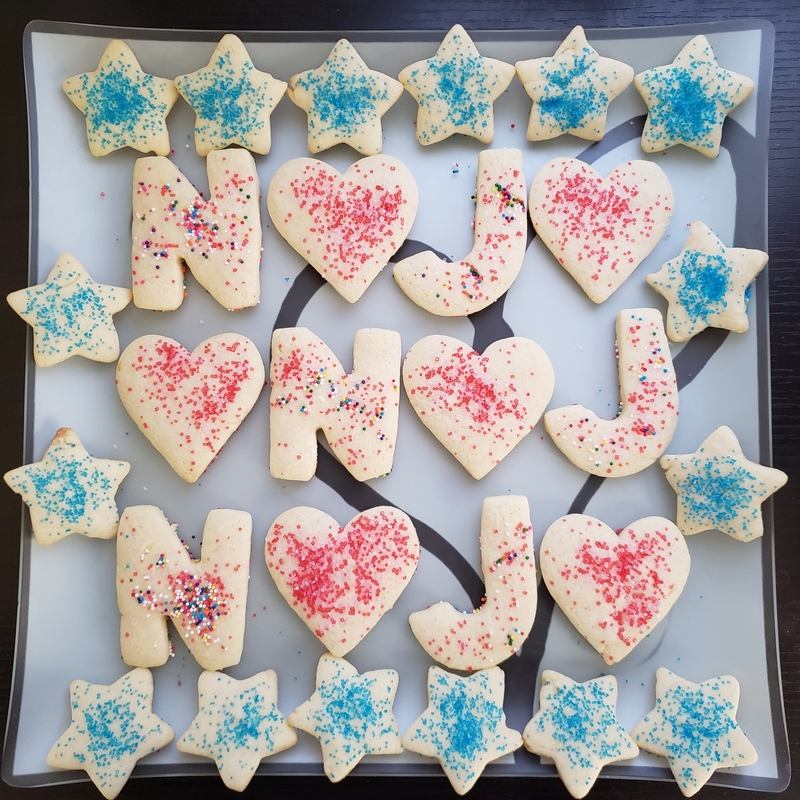 I still managed to crank out a few cookies for my doctors, hair stylist, etc. 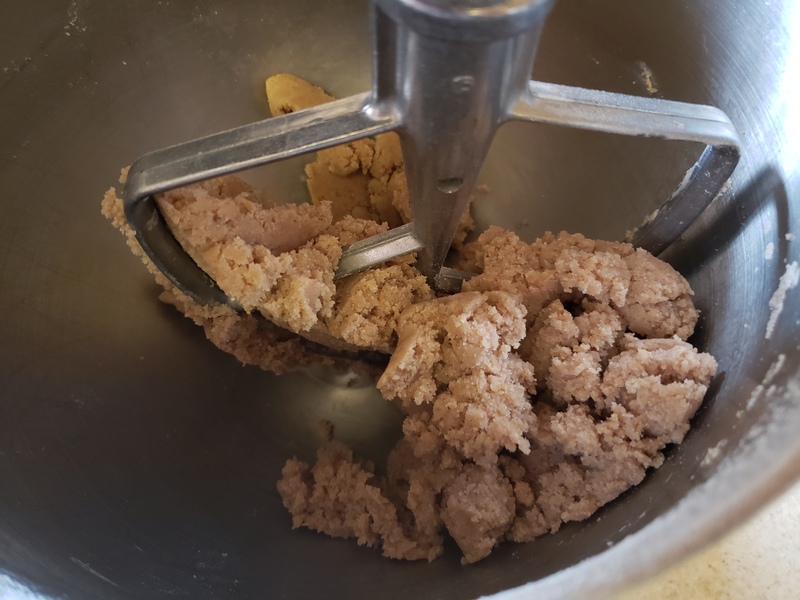 using my food processor, but it was nowhere near the variety or number that usually graces my table during the season. Needless to say, I was pretty bummed out by it. But hey, it was a small price to pay to have a functional heart! Luckily my parents are also pretty baking-happy during the holiday season, so I received a package in the mail with quite a variety of delicious goodies to enjoy. Of all the cookies they sent, it was the simplest one that I still craved days after polishing off. 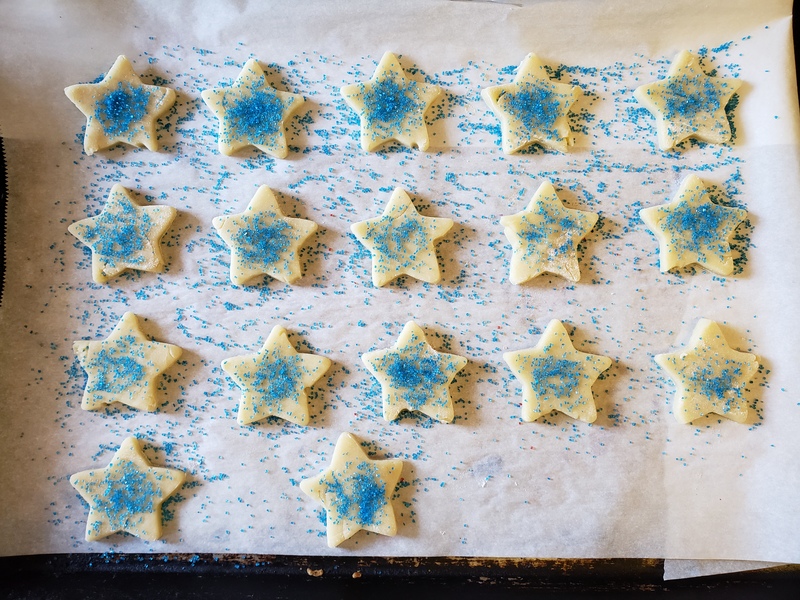 I speak of course of sugar cookies. 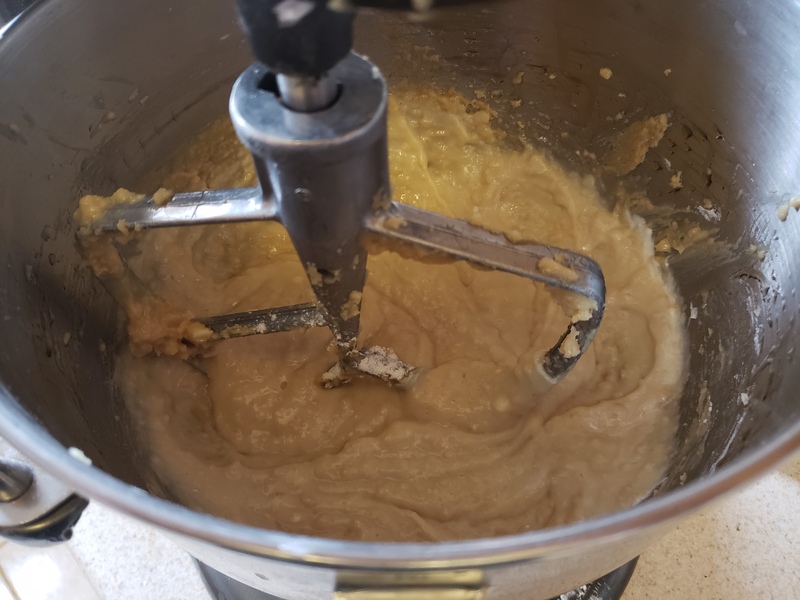 I asked my mom for the recipe, which she was kind enough to pass along, and swore that as soon as I was medically cleared to lift my stand mixer onto the counter again I’d make them and share them with all of you. Guess who can use both arms again??? Let’s celebrate with something sweet! 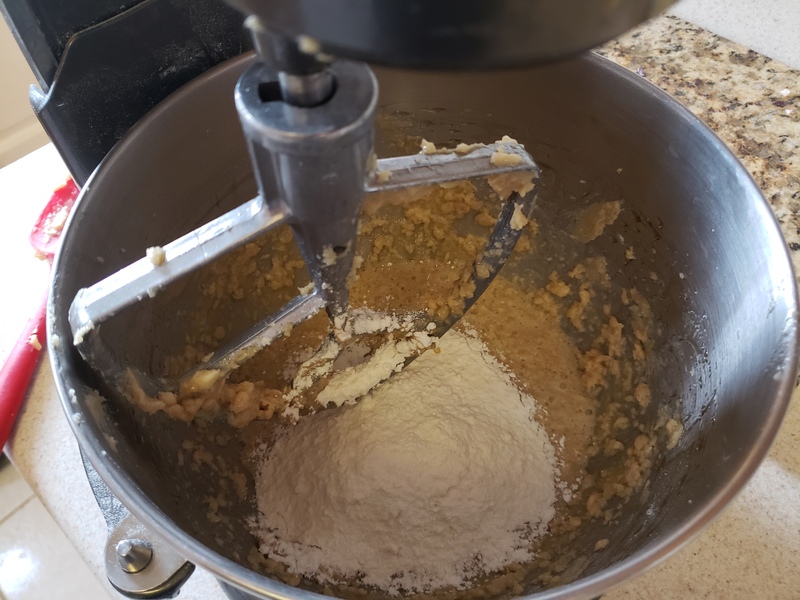 In a medium-sized bowl, sift together the flour, baking powder, and salt. Set aside. 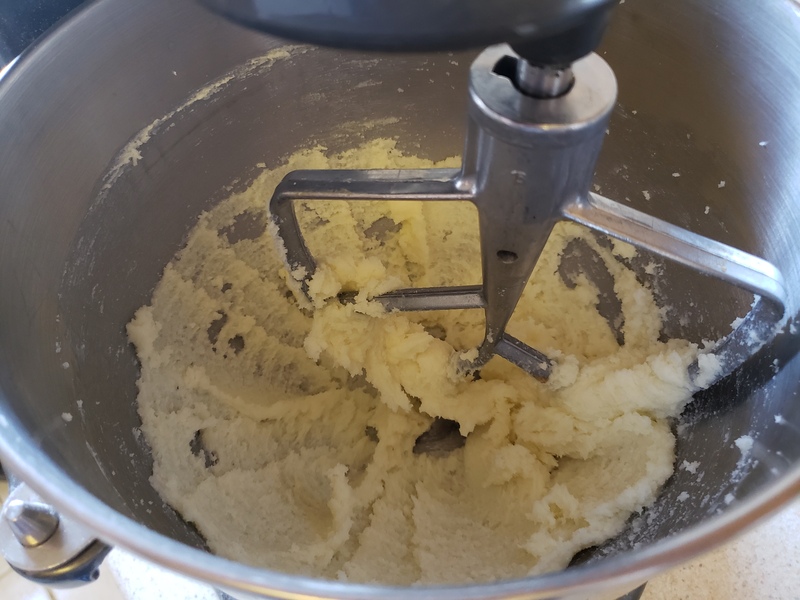 In the bowl of a stand mixer, beat the butter and sugar together on medium speed until smooth and fluffy. 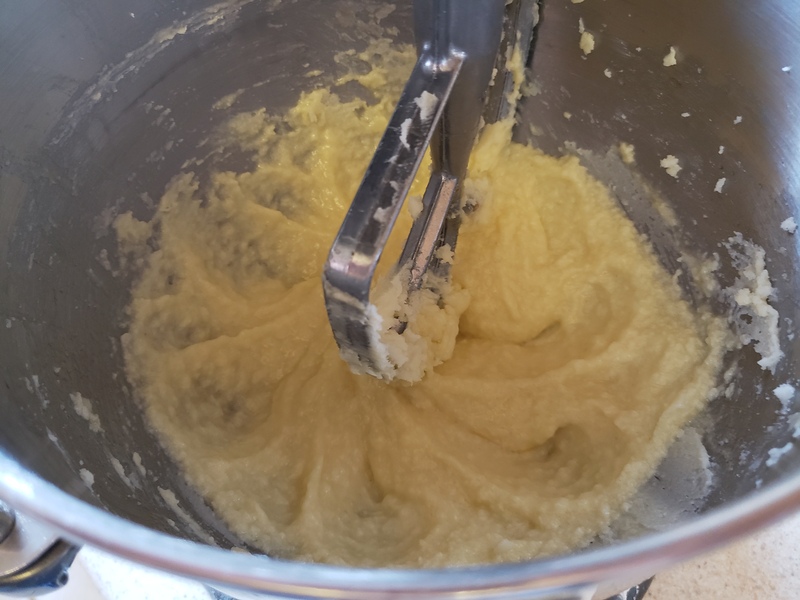 Add the eggs and vanilla extract and beat until well combined, scraping down the sides of the bowl as needed. 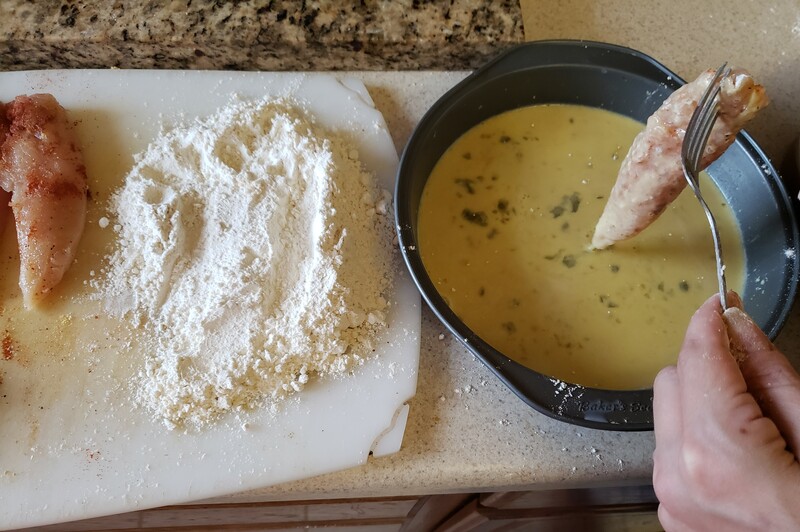 Add the flour mixture and stir until a soft dough forms. 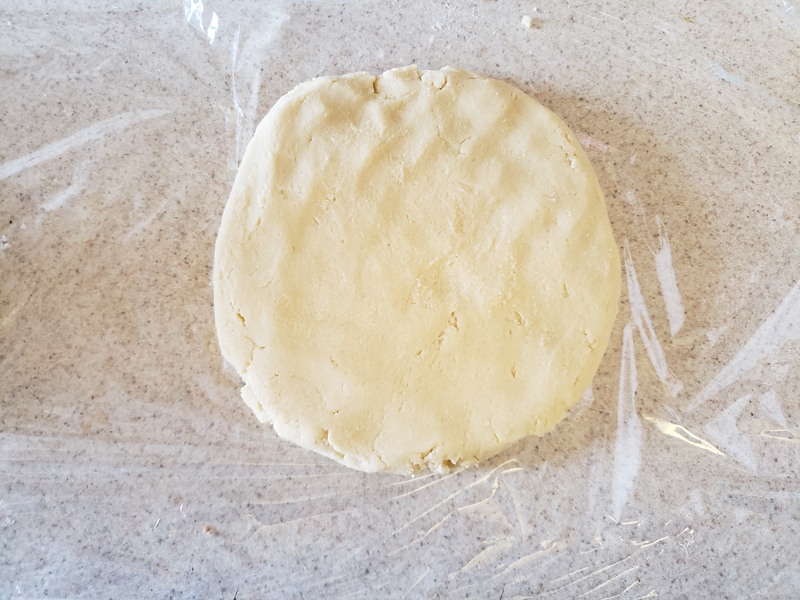 Gather the dough into a ball and then flatten into a large disc and wrap in plastic wrap. Chill the dough for at least one hour. 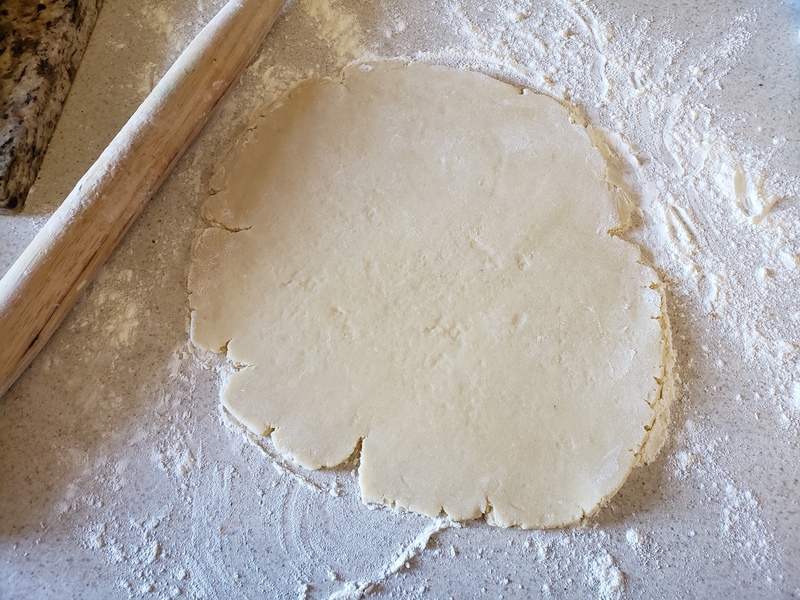 Lightly flour a work surface and then roll the dough out to ¼ in. – ½ in. thickness. 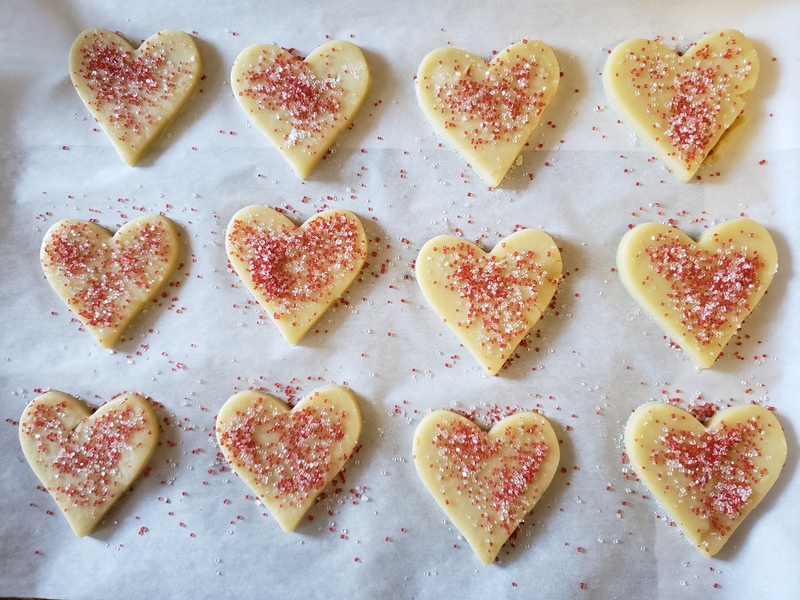 Cut out cookies and re-roll scraps as needed. 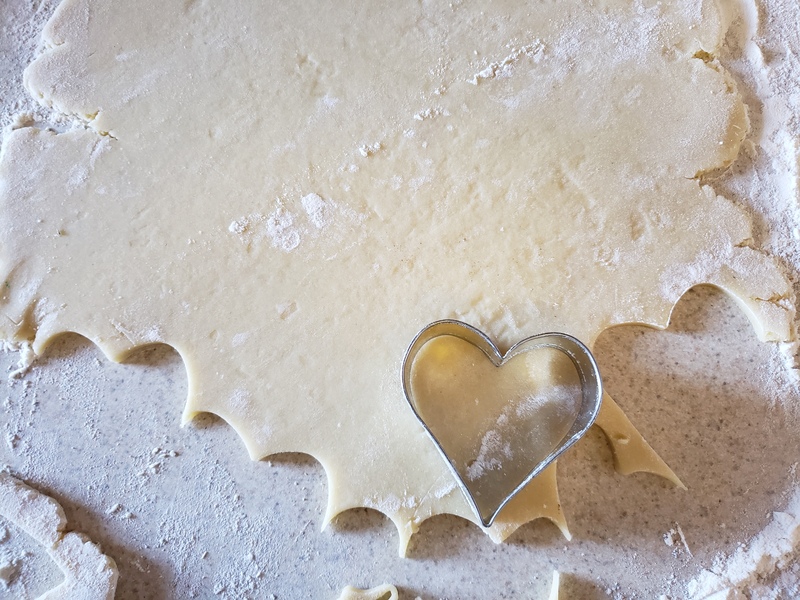 Depending on the size of your cookie cutters, this will make 3-4 dozen cookies. 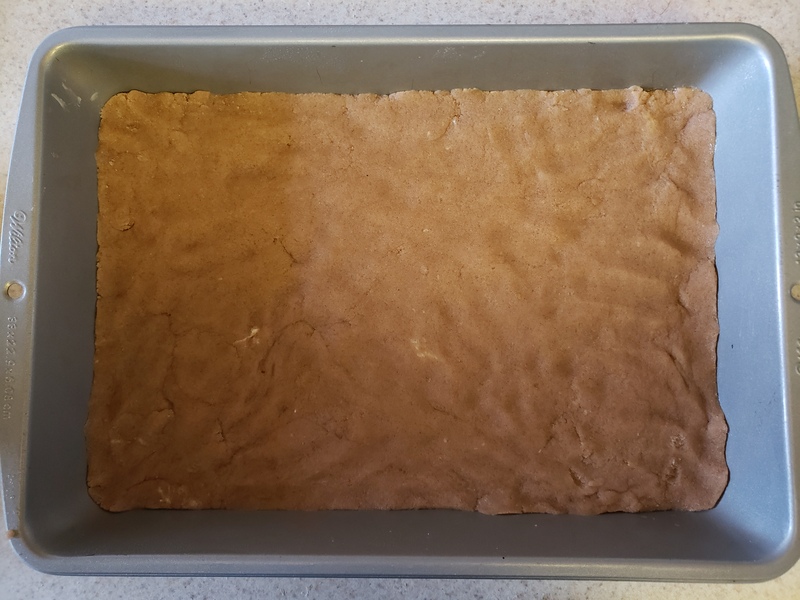 Arrange the cookies on a baking sheet about 1 in. 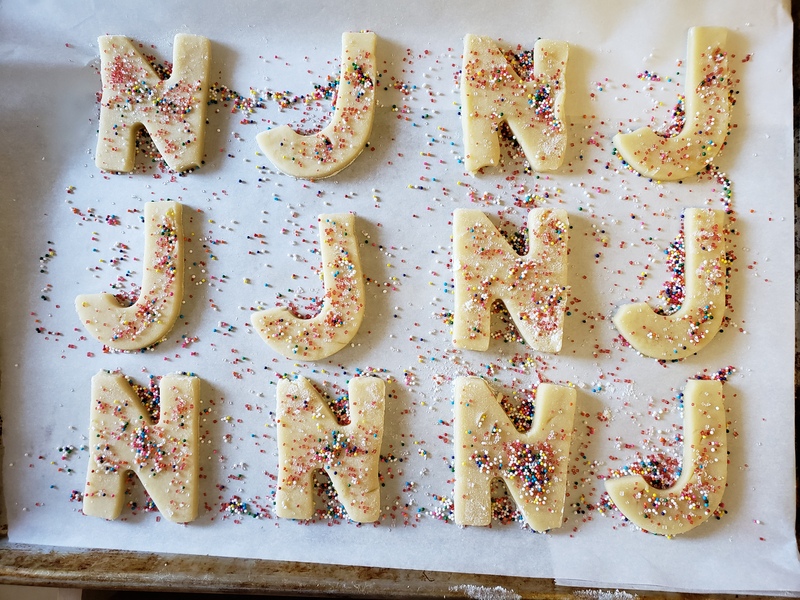 apart and top with sprinkles. Bake for 6-8 minutes or until just set and barely golden on the bottom. Cool completely on a wire rack. Store in an airtight container…if they last that long. 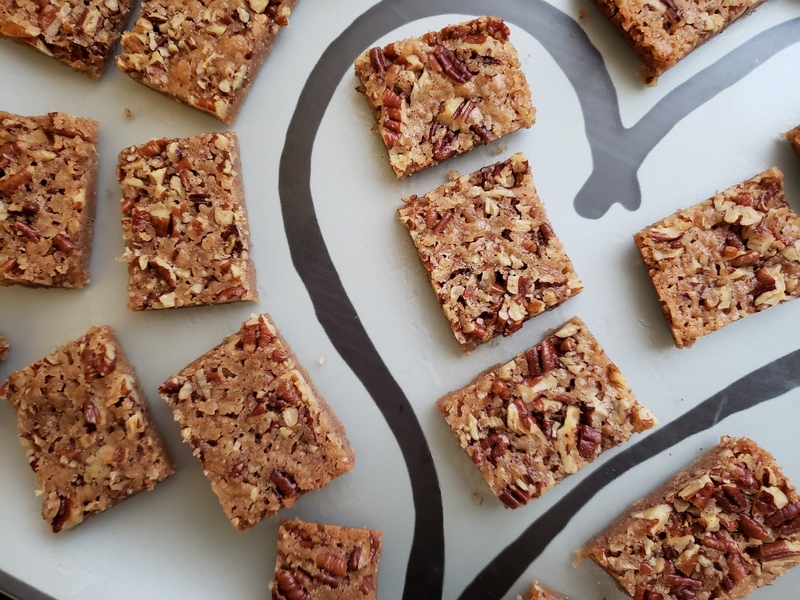 So even though they weren’t ready in time for the holidays, who says you can’t enjoy these sweet surprises year-round? 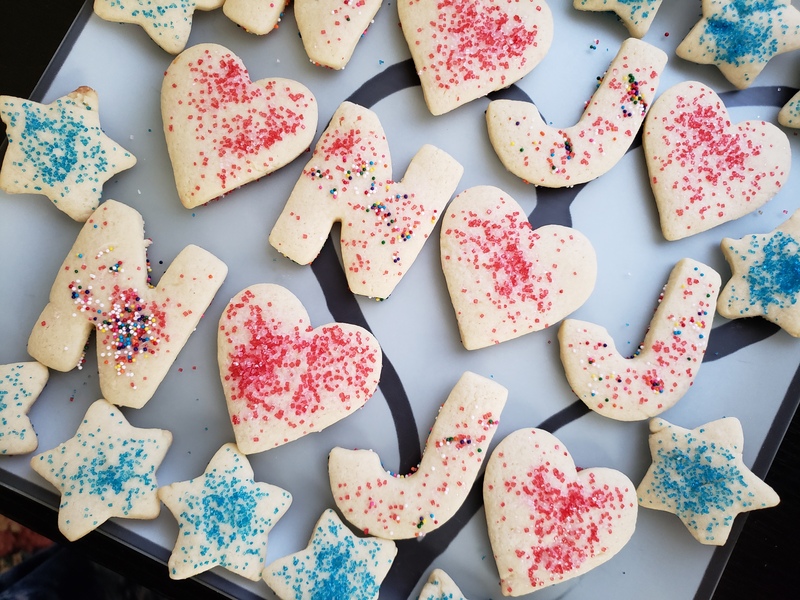 A gift of cookies is always sure to make someone smile, so share the love often. Hi there, remember me? Yes, it’s been a few weeks. And what a few weeks! Shortly after Thanksgiving, I ended up in the hospital after a series of blackouts. It turns out I had a complete heart block, which is where the electrical signal doesn’t make it from one chamber of the heart to the next. Basically it made my heart rate tank into the low 20s, making me very short of breath and causing the aforementioned blackouts. The solution to this problem was immediate surgery to give me a pacemaker, so that my heart can beat 100% at the proper speed. I feel GREAT! It’s really been like coming out of the dark. I’ve been fatigued for a long time and had no clue how bad I was feeling until, well, I wasn’t anymore. So that’s why I’ve been absent. 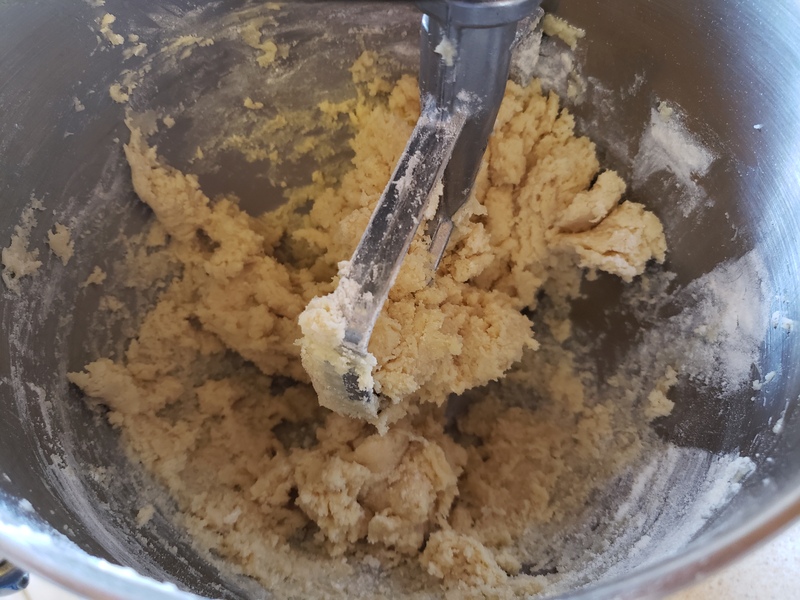 I can’t really use my left (dominant) arm for reaching, lifting, or straining for about a month, so baking has been pretty much out of the question. But I am finding ways to keep on cooking. One of the things suggested in my discharge papers from the hospital was to follow a heart-healthy diet. Not because I had any artery-blocking problems, but because reducing strain on the heart and preventing any of those issues is a generally good idea for someone who already has a pacemaker. 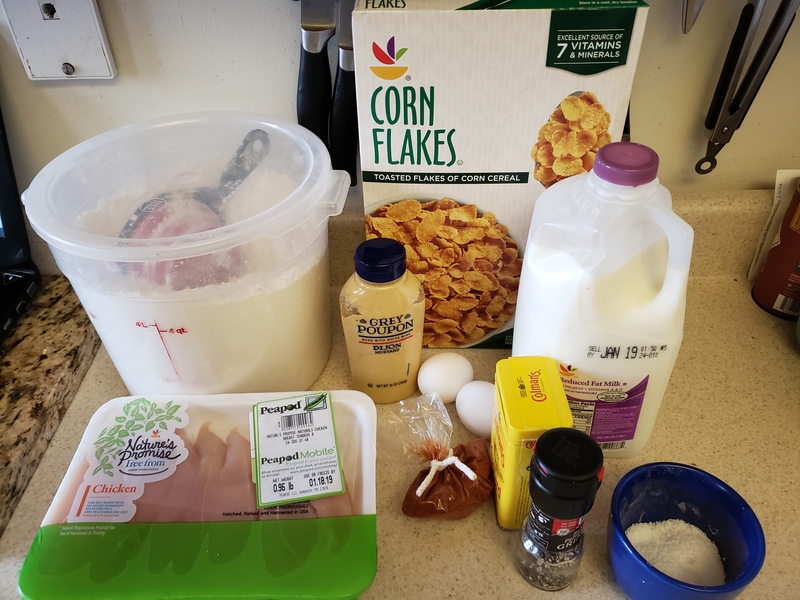 So I’ve been having fun both finding creative ways to cook and also some ways to alter favorite recipes. That brings me to today’s offering. 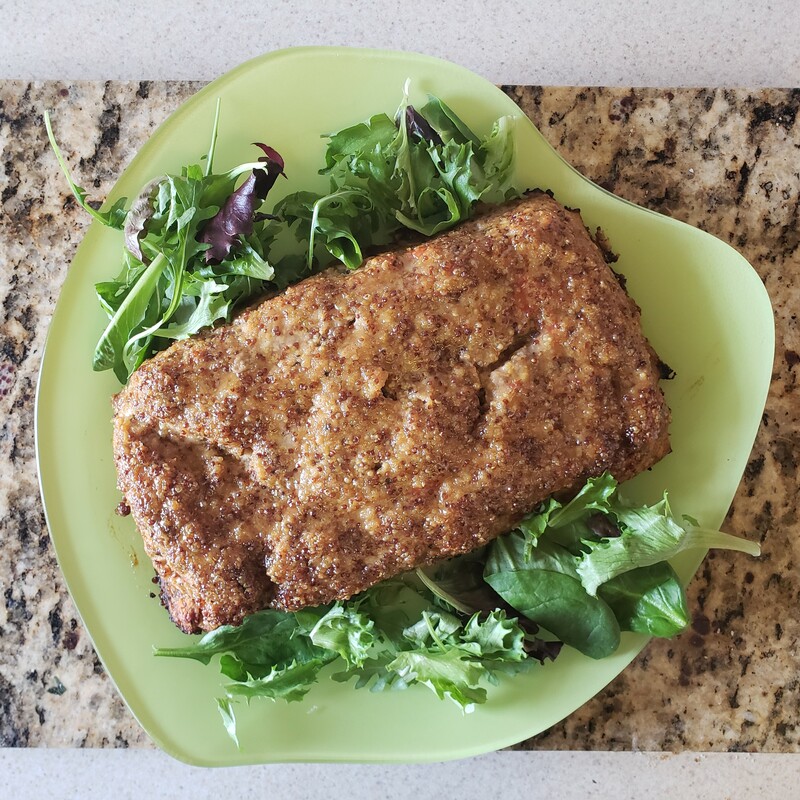 The perfect winter meal, both easy to prepare and surprisingly even better to reheat: Meatloaf. 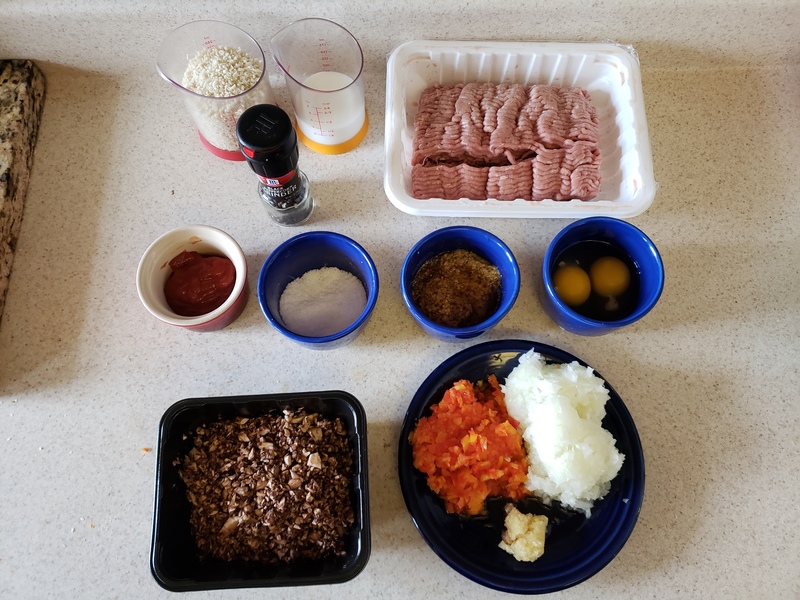 It’s easy to make a juicy meatloaf with beef and pork, but I was interested in taking something leaner and making it sing. 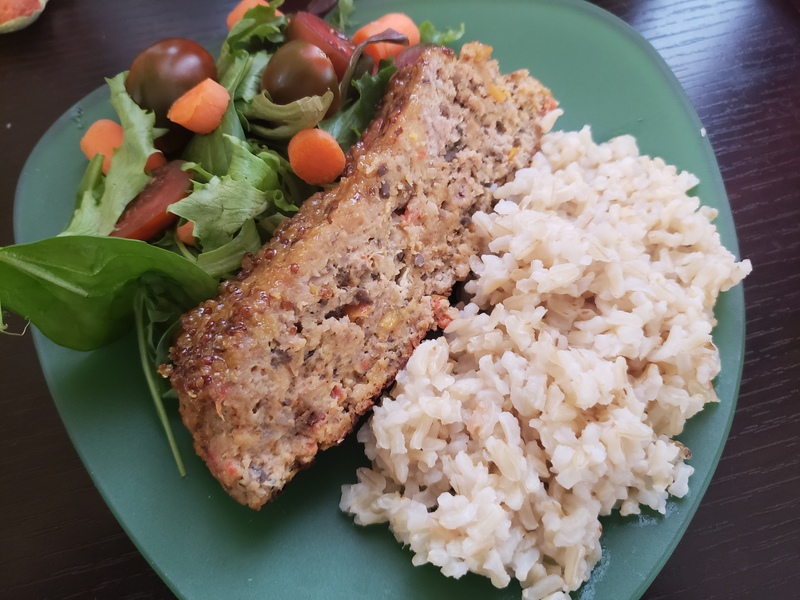 I turned to ground turkey, and while there isn’t much fat there to speak of, fat’s not the only way to keep a meatloaf moist both on the initial cooking and when you want to have a tasty meatloaf sandwich the next day. And the best part is that our additions will add lots of bright and earthy flavors to the party. 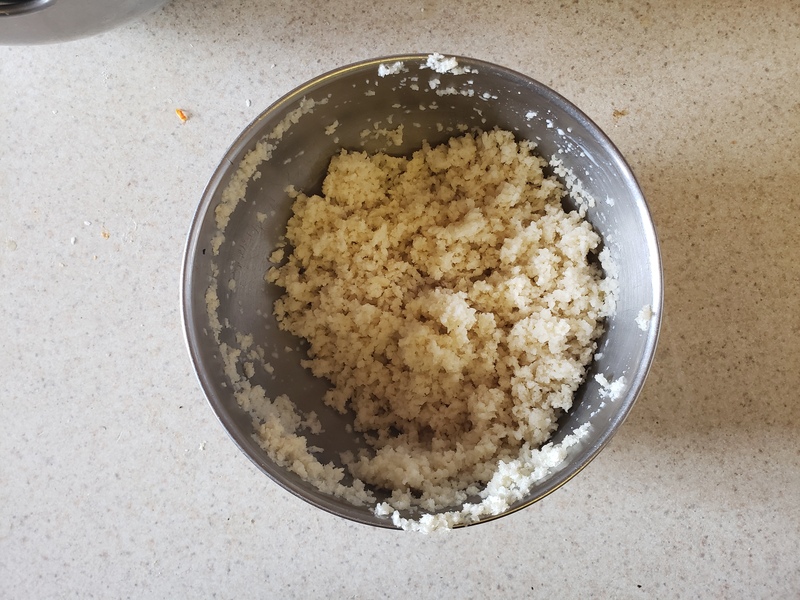 *I let my food processor do the work here since my arm mobility is limited and I’d recommend it for getting a super-fine, even dice. 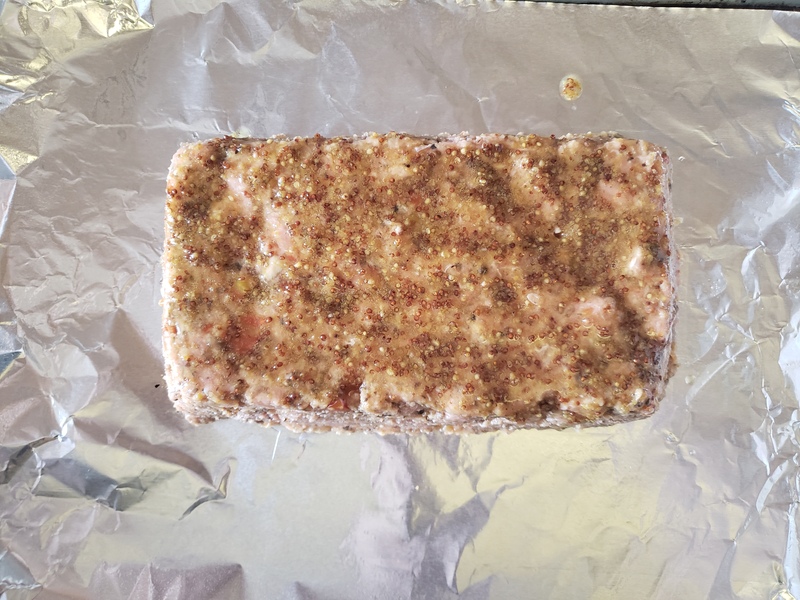 Preheat the oven to 400 degrees F and lightly grease a baking sheet lined with aluminum foil. Heat the oil in a large saute pan over medium-low heat. 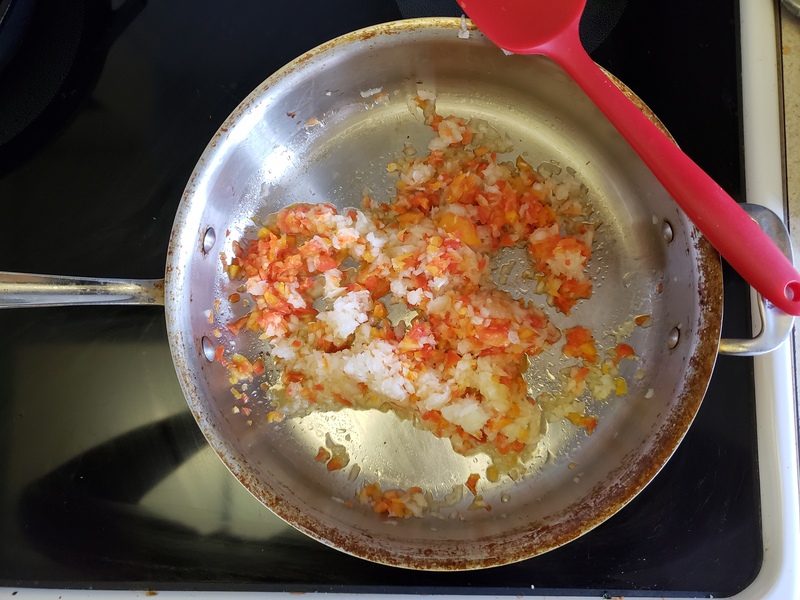 Once the oil is fragrant, add the onion, pepper, and a pinch of salt and cook until softened, about 4-5 minutes. Add the garlic and cook 1 minute more. Add the mushrooms, a pinch of salt, and a pinch of freshly ground black pepper. Cook until the mushrooms release their liquid and it evaporates, about 7-8 minutes. Transfer the vegetable mixture to a large bowl and stir in the Worcestershire sauce and ketchup. Set aside to cool slightly. 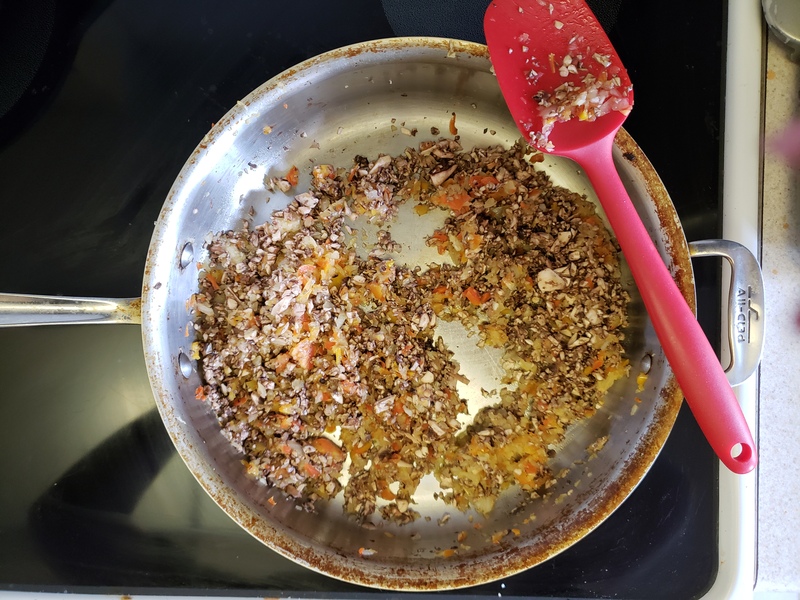 Add the bread crumb mixture and eggs to the vegetable mixture and stir well. 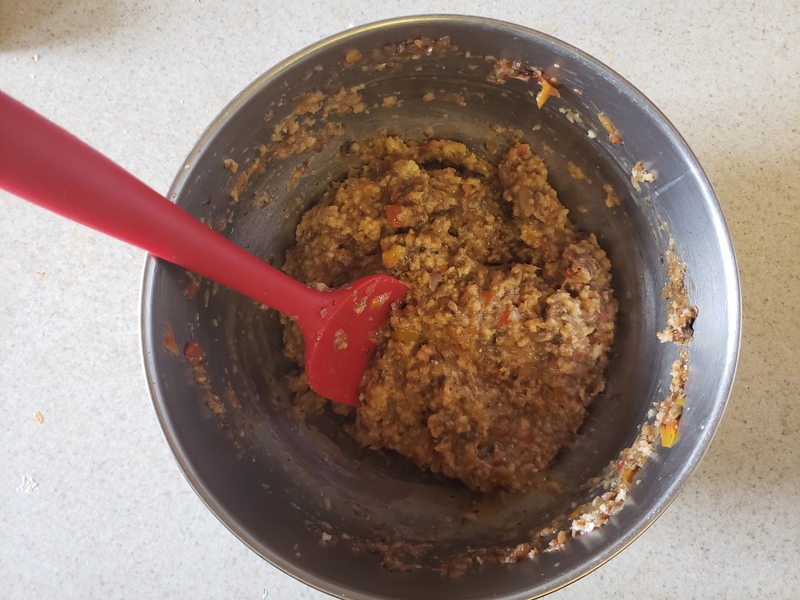 Then, using your hands or a spatula, mix in the turkey. You can either free-form the loaf into a 9×5 in. 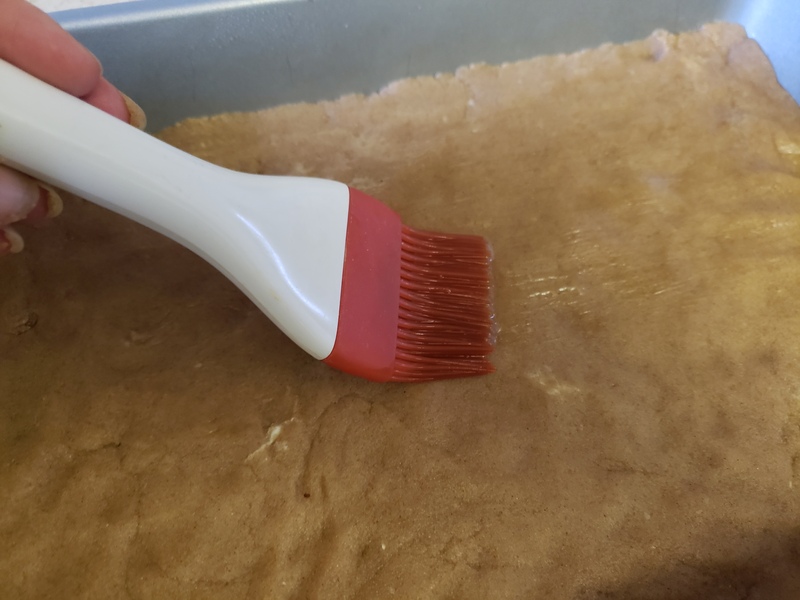 oval or use a 9×5 loaf pan as a mold and then turn it out onto the prepared baking sheet. 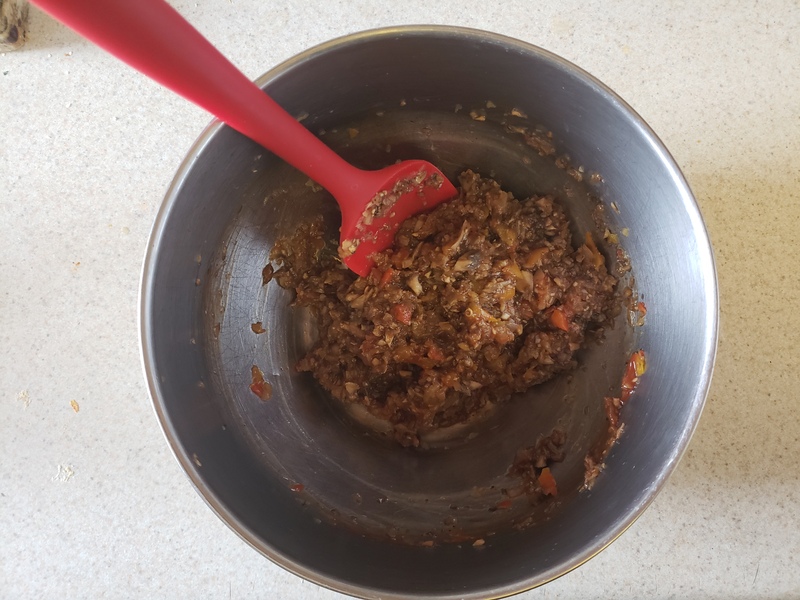 Combine the honey and mustard, and glaze half of it on the meatloaf. 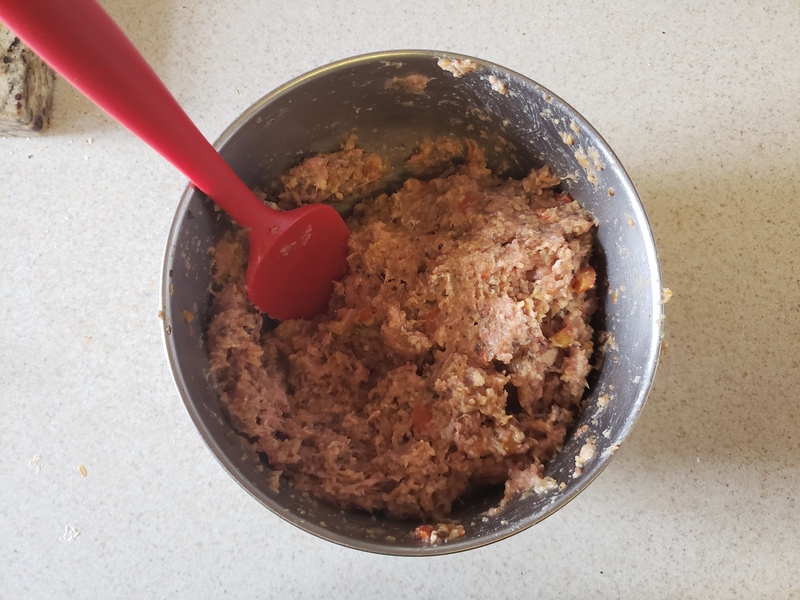 Bake the meatloaf for 30 minutes, and then spread the remaining glaze on top and bake until an instant-read thermometer inserted in the middle registers 170 degrees F, about another 10 minutes. 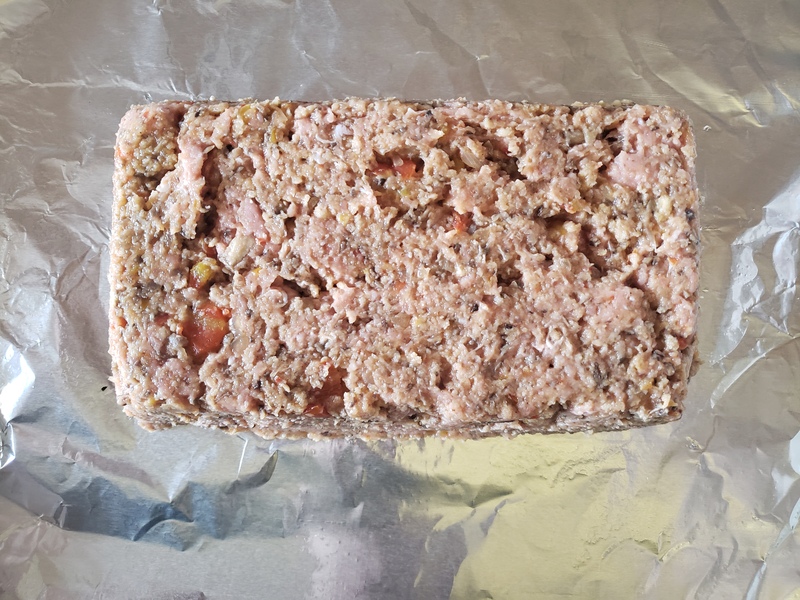 Let the meatloaf rest for 10 minutes before slicing. I think a serrated knife works best for getting clean slices. 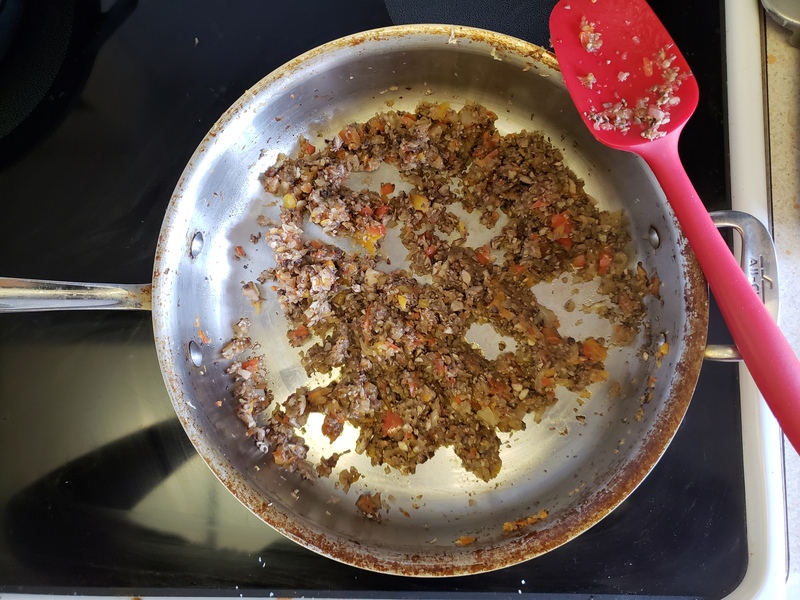 The mushrooms add moisture and a nice meaty texture, while the bell pepper also adds some juiciness and brightens the whole dish. My favorite part is the tangy-sweet honey-dijon glaze that really amps the flavor up. I enjoyed mine with some mixed greens and brown rice for a perfectly delicious and very filling heart-healthy meal. I’m really happy to be healing well, and can’t wait to get back to baking soon. My posts might be a bit intermittent for the near future, but I’m always thinking up new treats to share, and will be back to regularly scheduled programming ASAP. I hope you enjoy every moment of this holiday season. I know I am extra, EXTRA grateful this year just to be here. 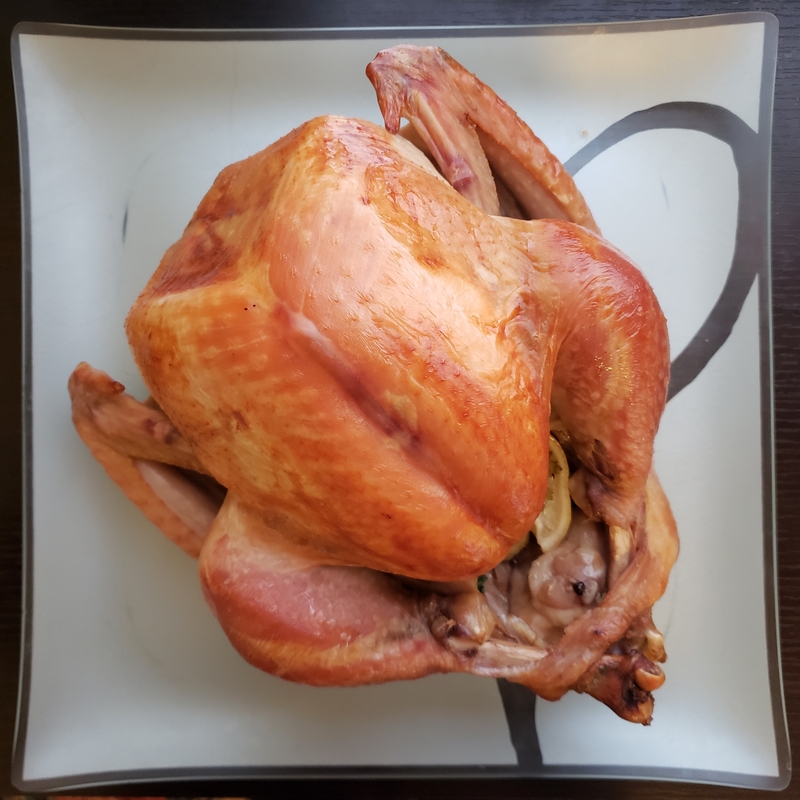 We ended up going out to dinner on Thanksgiving this year, but Joe and I really did want to have the traditional turkey dinner at some point at our own leisure. So when I happened upon the perfectly sized 10 lb. turkey at the store over the weekend, we opted for a little mid-week celebration. A Thanksgiving 2.0, if you will. 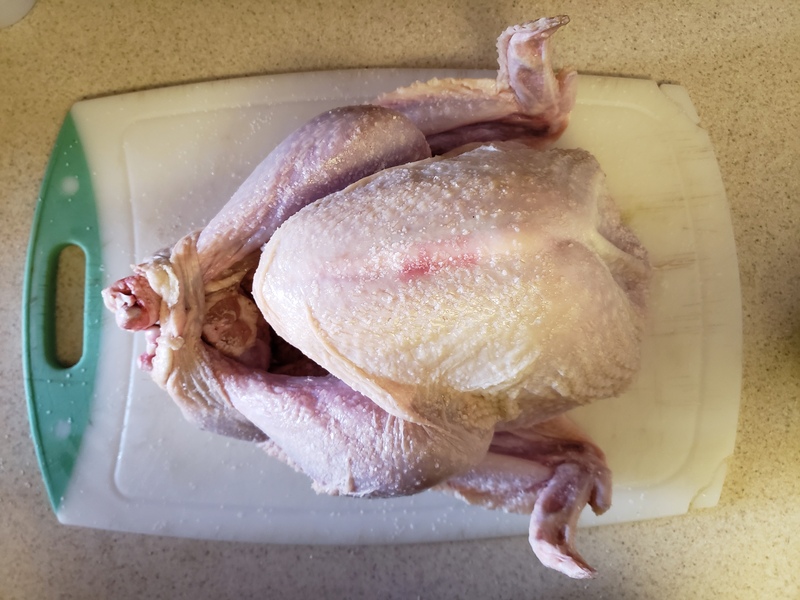 There are a lot of ways to roast a bird, but I stumbled across the cheesecloth method a few years ago and it has never failed to produce a juicy bird with a crisp skin. With Christmas on the horizon, I thought I’d share this with you as it’s a method that will work with just about any bird you choose to serve. This savory centerpiece is a definite crowd pleaser, and in my opinion it’s pretty easy to prep and cook. So let’s roast! 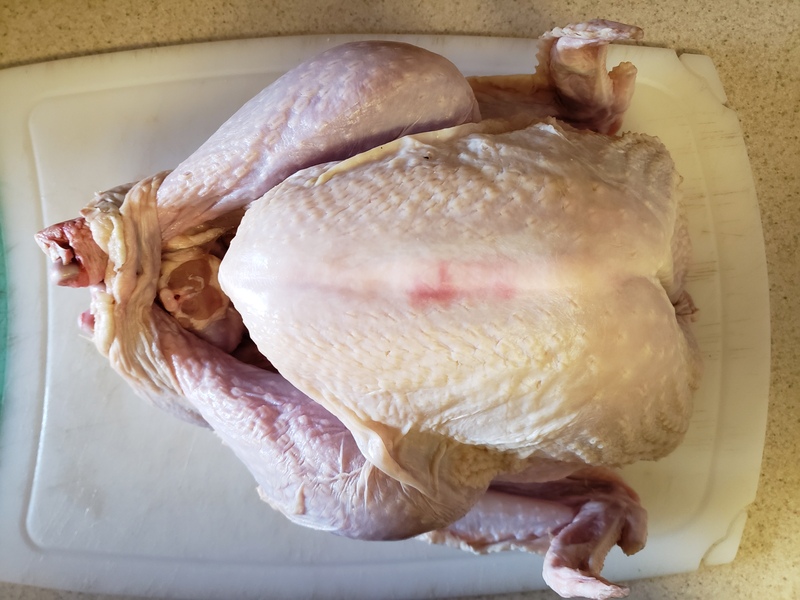 The day before roasting, rinse the turkey inside and out with cold water and then pat dry with paper towels. 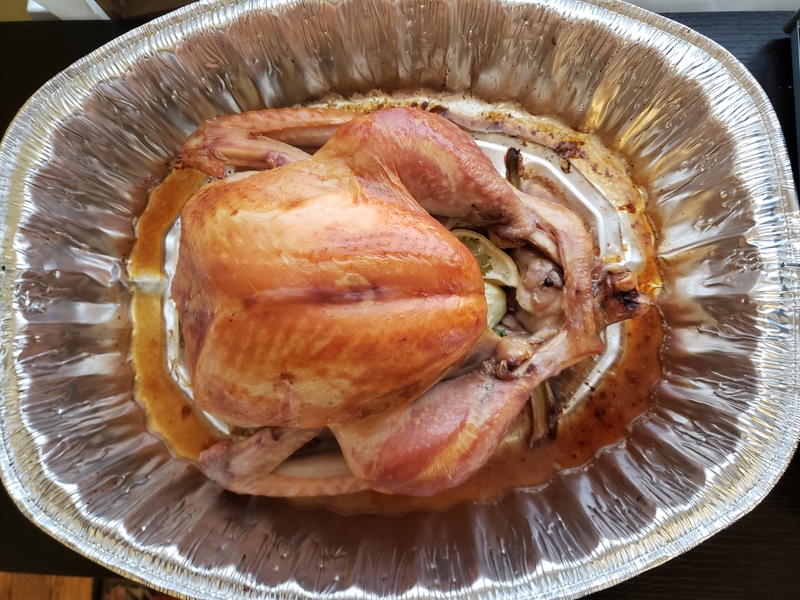 Season the turkey inside and out with the salt. 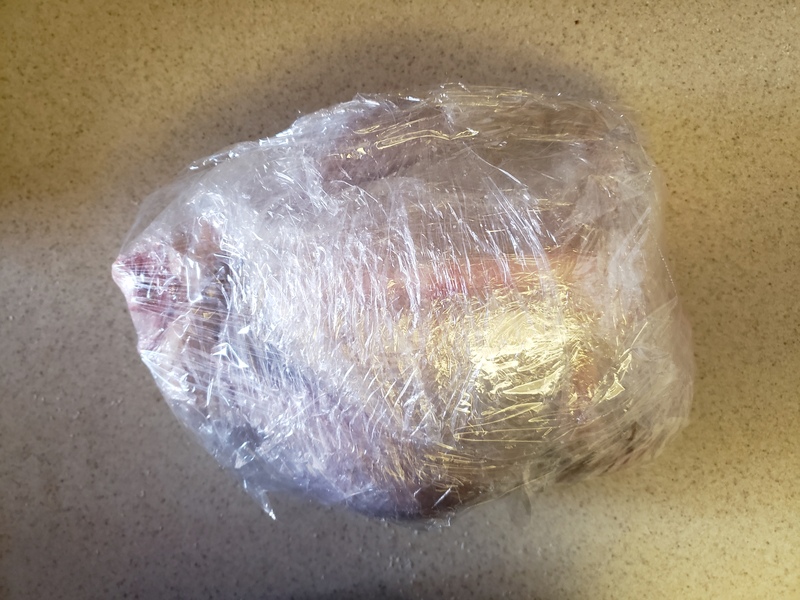 Wrap the turkey in plastic wrap and refrigerate for 24 hours. Remove the turkey from the refrigerator 1 1/2 hours prior to roasting to bring to room temperature. Preheat the oven to 425 degrees F with the oven rack set on the lowest rung. 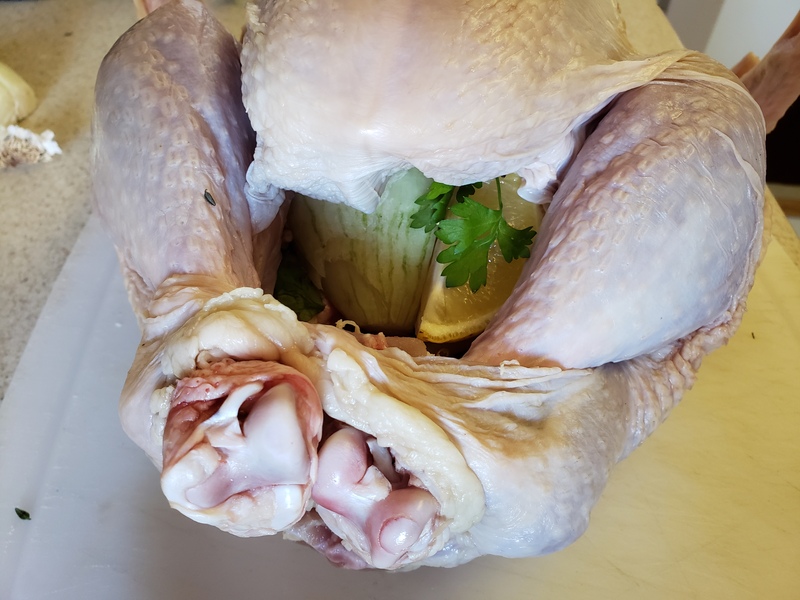 In the turkey’s neck cavity, place a few cloves of the garlic, a few sprigs of rosemary, thyme, parsley, and a quarter of the lemon. Wrap the neck skin over and around the cavity to enclose the seasoning ingredients. 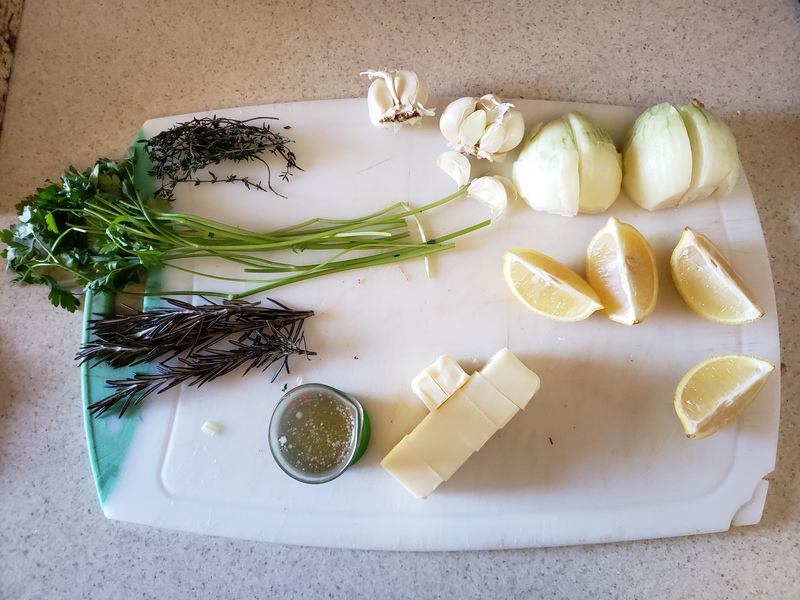 In the body cavity, place half of the remaining garlic, half of the onion, 2 lemon quarters, and half of the remaining parsley and thyme. Place the turkey, breast side up, on a rack set into a large roasting pan. 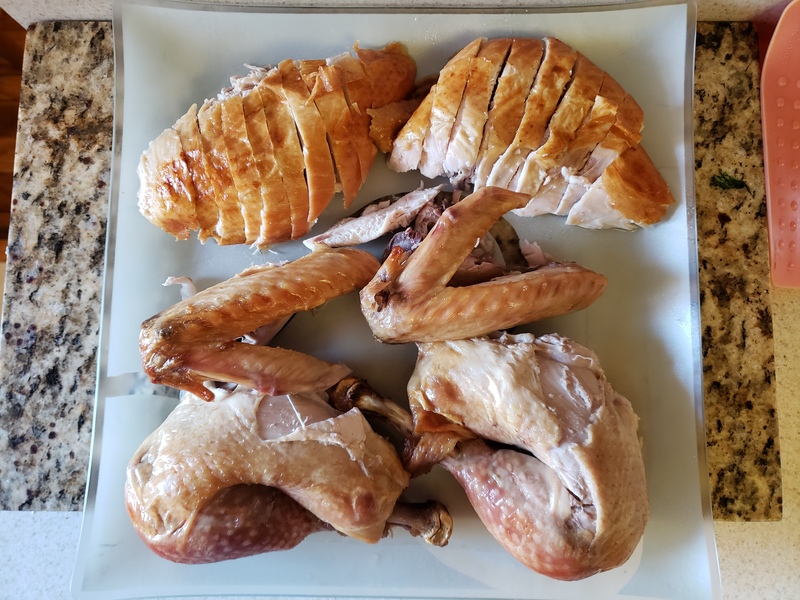 Fold the wings and tuck the tips underneath the bird. 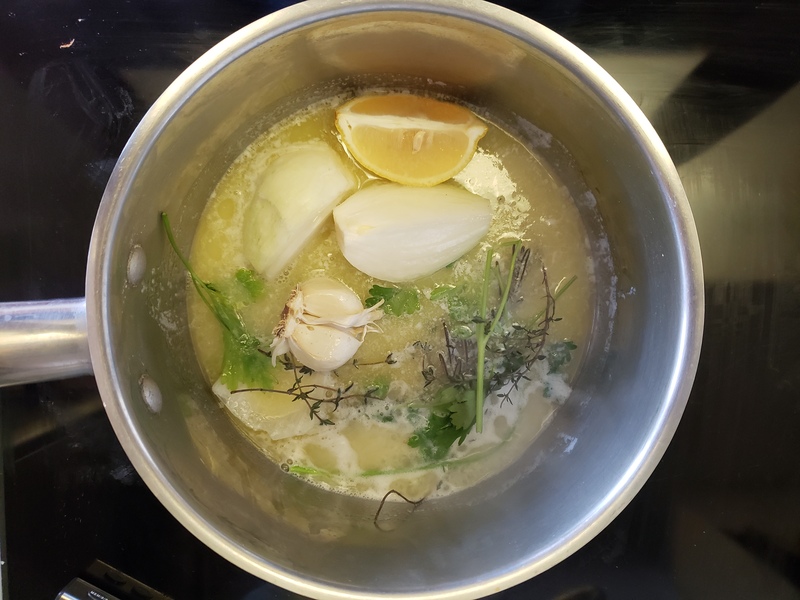 In a medium saucepan over medium heat, melt the butter and add the remaining garlic, onion, lemon, and herbs to the pot with the stock. Bring to a boil, and then reduce to a simmer, cooking for 5 minutes. Remove from the heat and cool slightly. 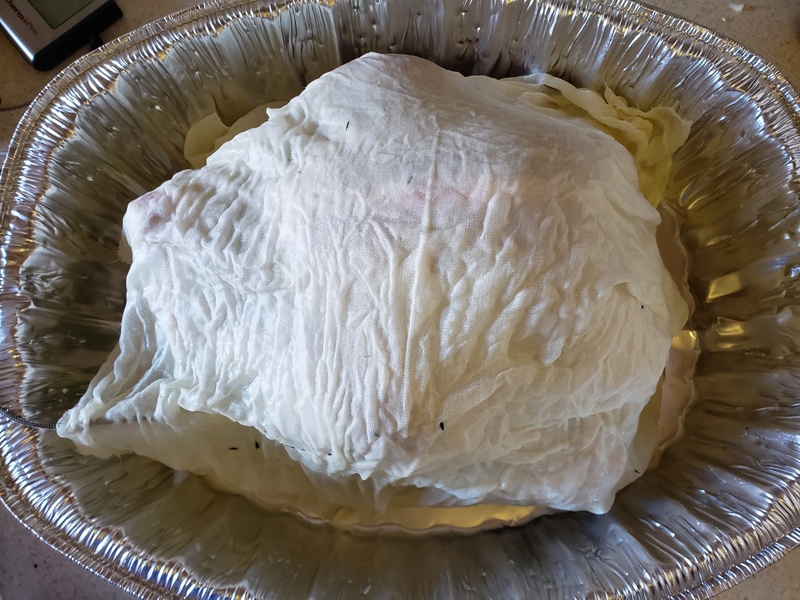 Soak the cheesecloth in the butter mixture and then drape it in a double layer over the turkey. 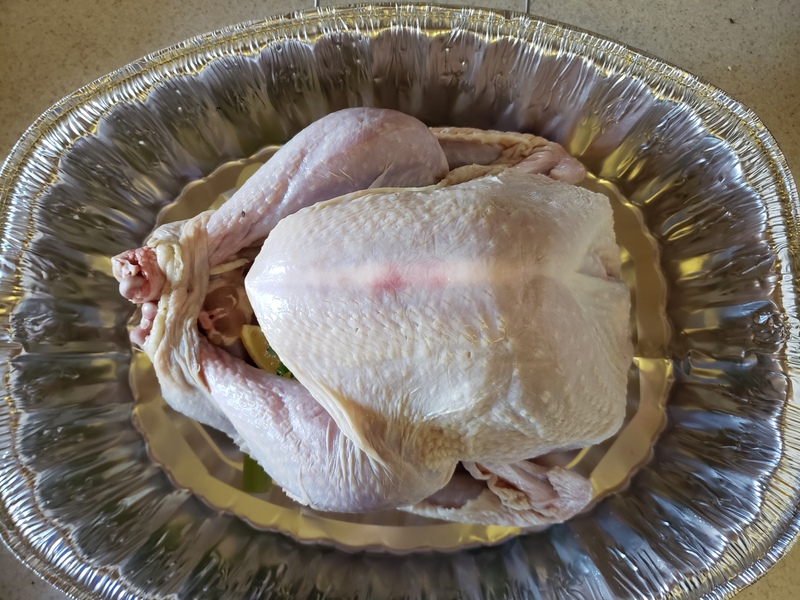 Put the turkey in the oven and roast for 45 minutes, then turn the oven temperature down to 375 degrees F, and roast for another 15 minutes per pound (removing the cheesecloth for the final 10 minutes to brown), or until an instant-read thermometer inserted into the center of a thigh registers 160 degrees F (about 3 hours). Remove the turkey from the oven and let it rest for 20 minutes before carving. As I said before, the skin is crisp and savory, while both the dark and light meat are juicy and flavorful. We enjoyed ours thoroughly with some macaroni and cheese and my apple-sausage dressing. The leftovers are tucked away for sandwiches, and maybe even sharing with Dioji and Zero. 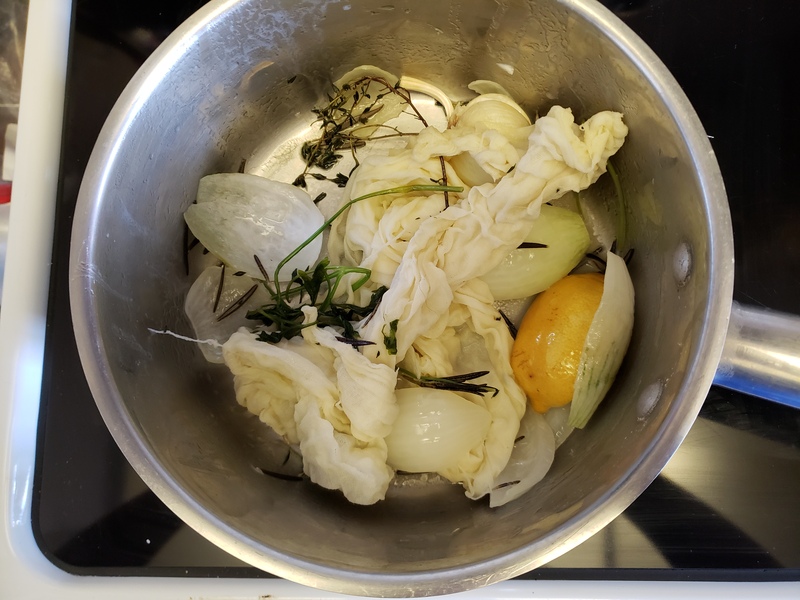 Don’t forget to save the carcass and any vegetable odds and ends to make turkey stock! Waste not, want not after all. Hope you’re enjoying your holiday season as much as we are. Give this one a try soon. With it’s buttery cheesecloth robe, your bird will be dressed to impress and full of flavor. When I was growing up, we spent nearly every Christmas at my paternal grandmother’s house. If I close my eyes, I can still smell her kitchen. 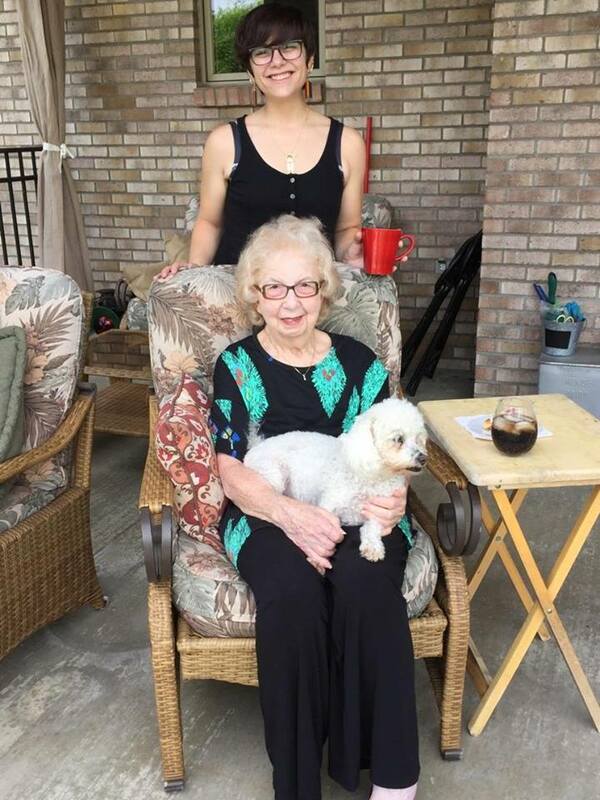 So many of my favorite foods came from her; broccoli casserole, ham pies, sauce and meatballs, pretzel jell-o (don’t knock it ‘til you try it), pumpkin pies, her breaded chicken, and especially an array of Italian and not-so-Italian cookies. 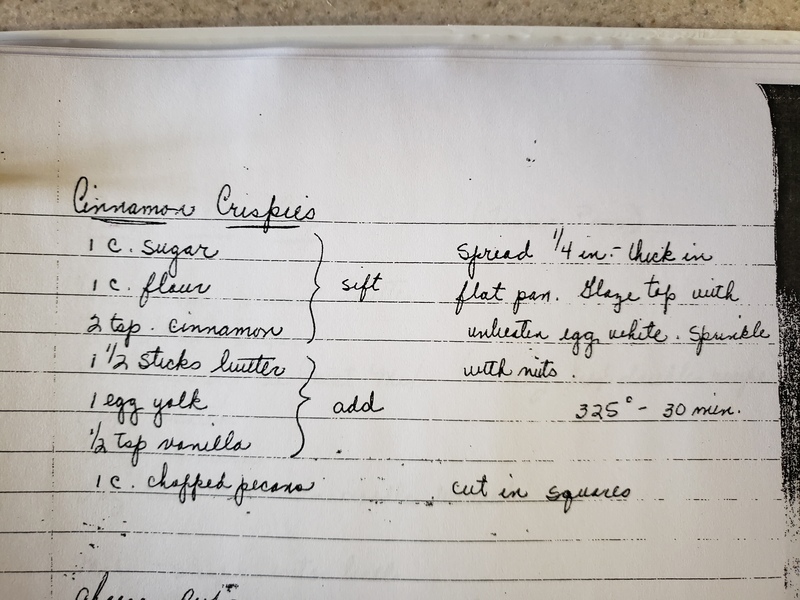 When we celebrated Gram’s 90th birthday over the summer, my cousin Emily surprised all of us with a cookbook of her recipes written in her beautiful script handwriting. To me, it was the greatest treasure anyone could bestow. A little under two weeks ago, my Gram passed away after a long battle with Parkinson’s disease. As we stood in the funeral home, surrounded by flowers and mourners, I turned to my cousin and said, “You know what Gram would have said about all of this, right?” We both smiled and nearly in chorus said, “Oh this is ri-DIC-ulous!” My Gram had no time for pageantry and no love for flowers. Her love and affection was, like mine, spread through sharing food and especially telling people, “Oh, you don’t eat nothing!” before scooping another meatball or piece of pie onto their plate. I will admit to doing this to my own husband many times. 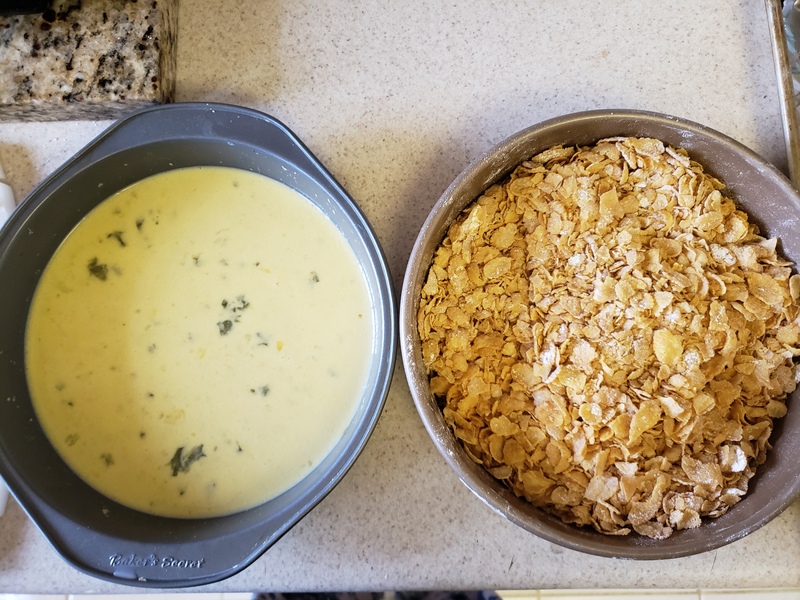 After we returned to Arlington following the funeral, I started going through the cookbook of her recipes and smiling at the ones that reminded me of her kitchen. 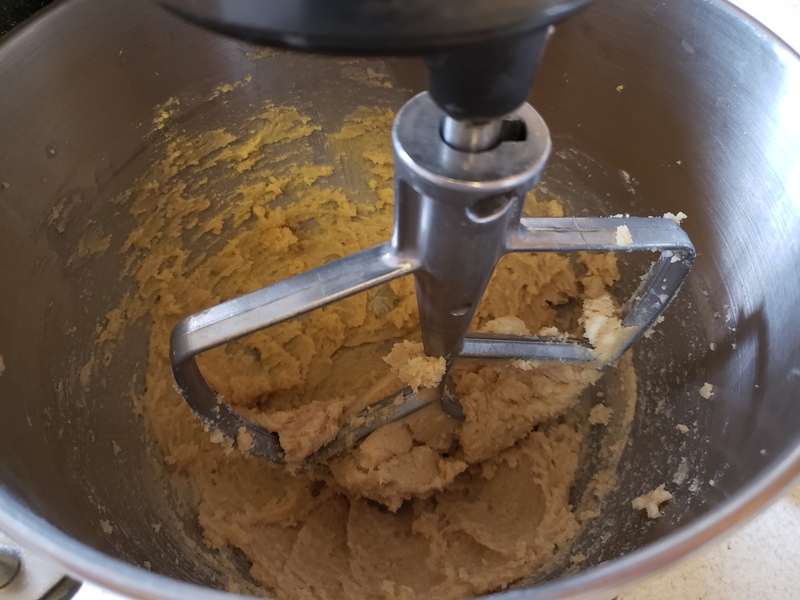 I laughed at all the mentions of “two handfuls of Crisco” or “two scoops of sugar.” Like so many good cooks, she did things by feel and not by a structured recipe or method. Her recipes matched the time in which she learned to cook too. I can’t tell you how many times Oleo is mentioned in this cookbook. First of all, is the butter soft? Is it cut in cold? And if soft, why isn’t it creamed with the sugar first? 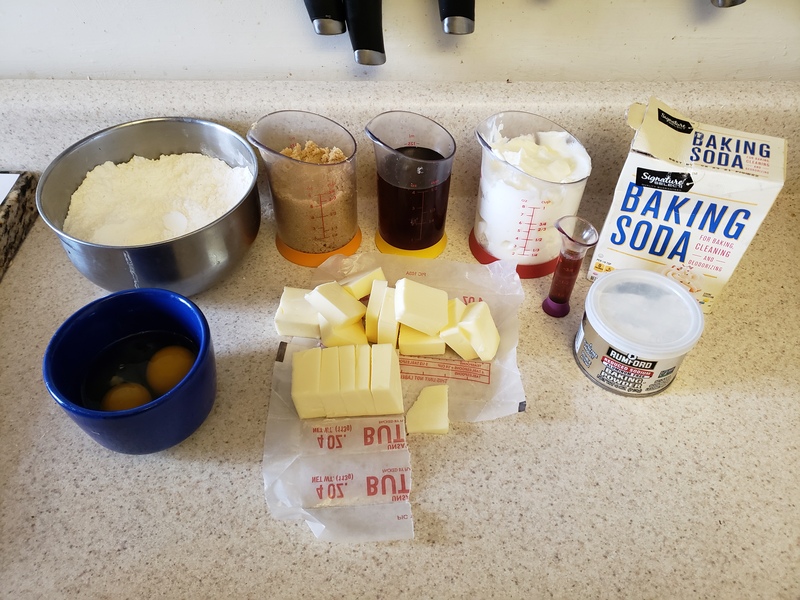 If sugar is a dry ingredient does that imply more of a pastry consistency? 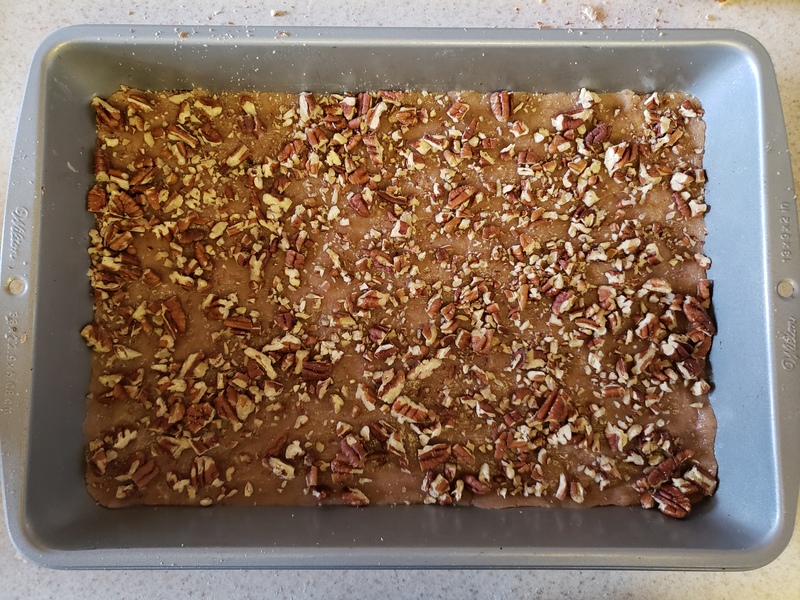 Is a flat pan a sheet pan or a cake pan? What should it look like when it’s done??? 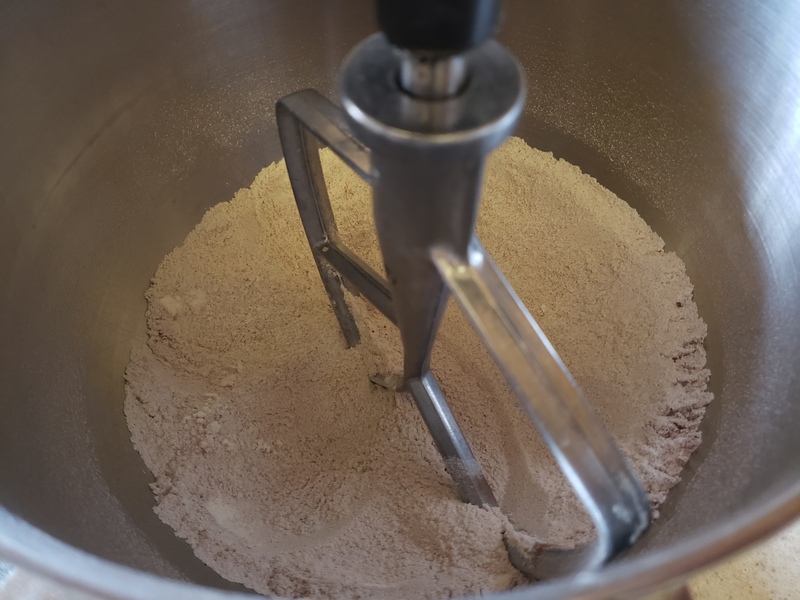 Sift together the flour, sugar, and cinnamon in a large mixing bowl. 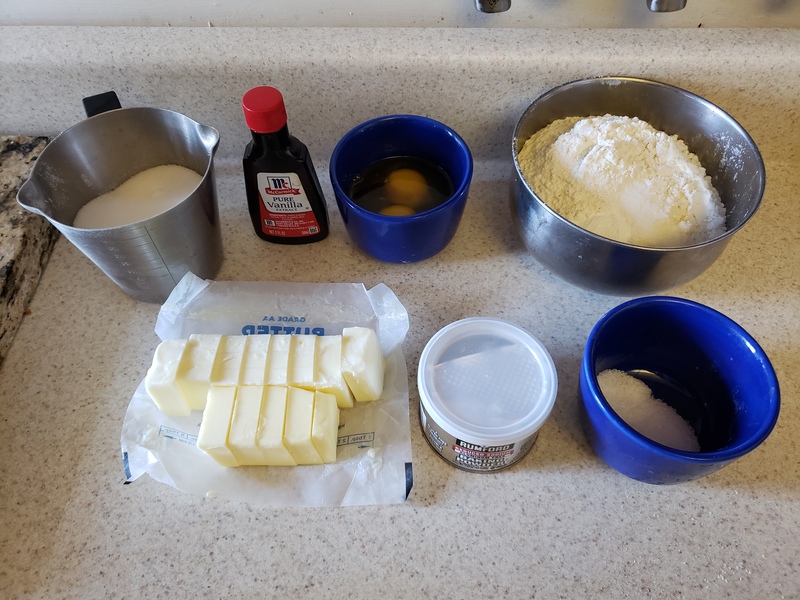 Add the butter, egg yolk, and vanilla extract, and mix until a soft dough forms. 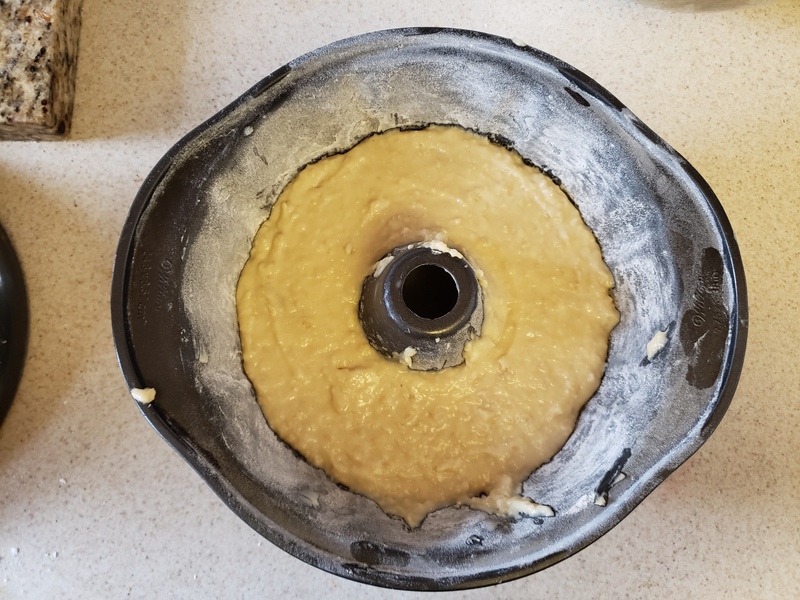 Press the dough into an even ¼ in. layer in a 9×13 in. baking pan. 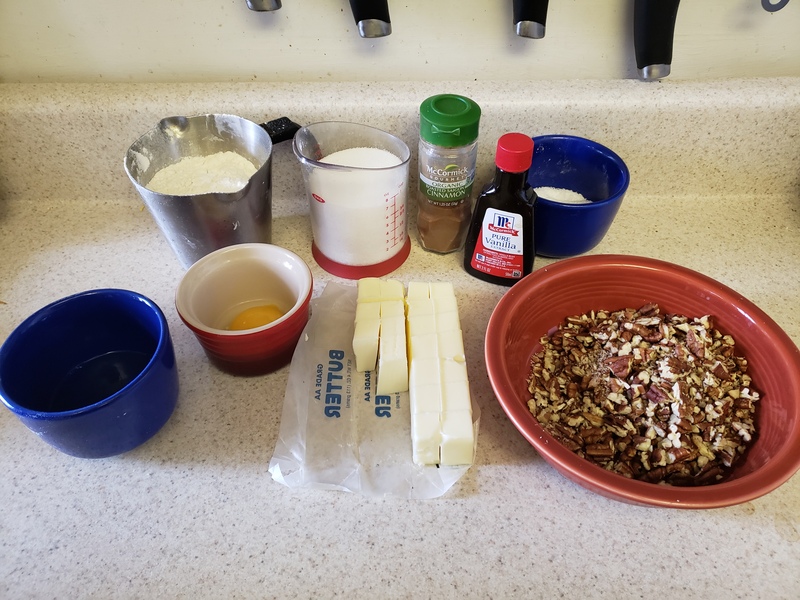 Brush the top of the dough with the unbeaten reserved egg white and sprinkle on the chopped pecans. 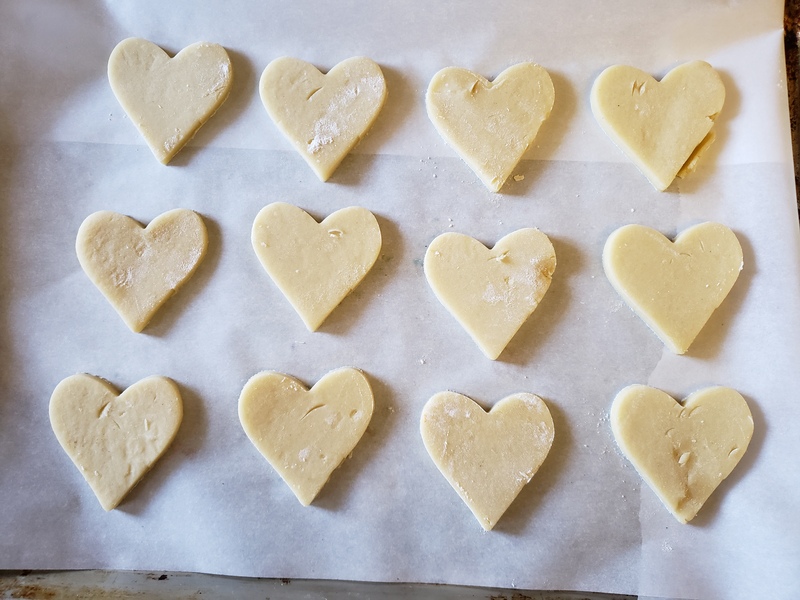 Remove and cool in the pan for 15 minutes before cutting into squares. They are, as advertised, both cinnamon AND crispy. 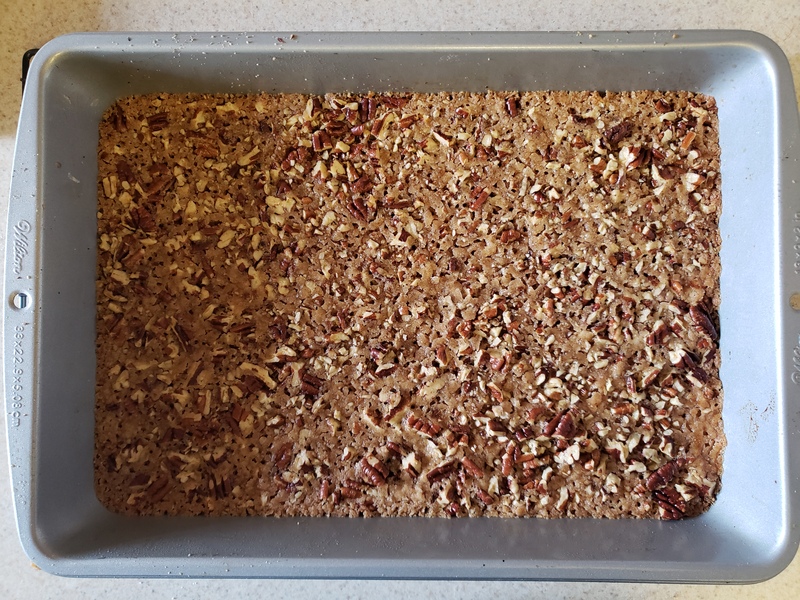 The cookie layer has a little bit of chewiness to it, but the butter toasts the pecans and makes the top so crunchy. Ri-DIC-ulously delicious.